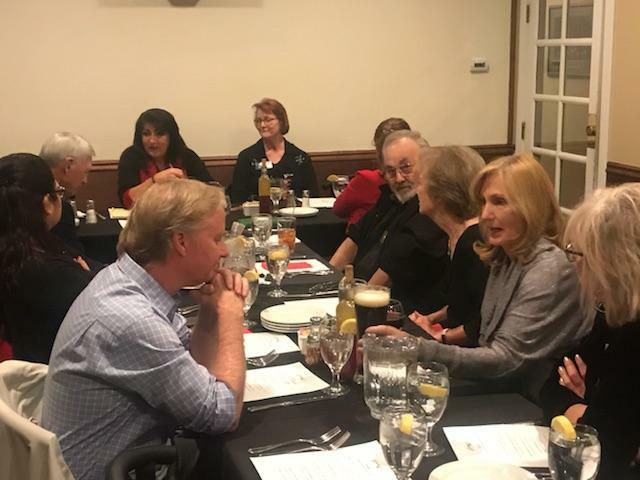 The Rotary Club of Palmdale conducted their weekly meeting at Gino’s Italian Restaurant in Palmdale on 10 April 2019 due to the fact that Sizzler’s Restaurant was completely booked in our meeting room. The meeting was called to order by President Sam Garcia at 6:30 PM. 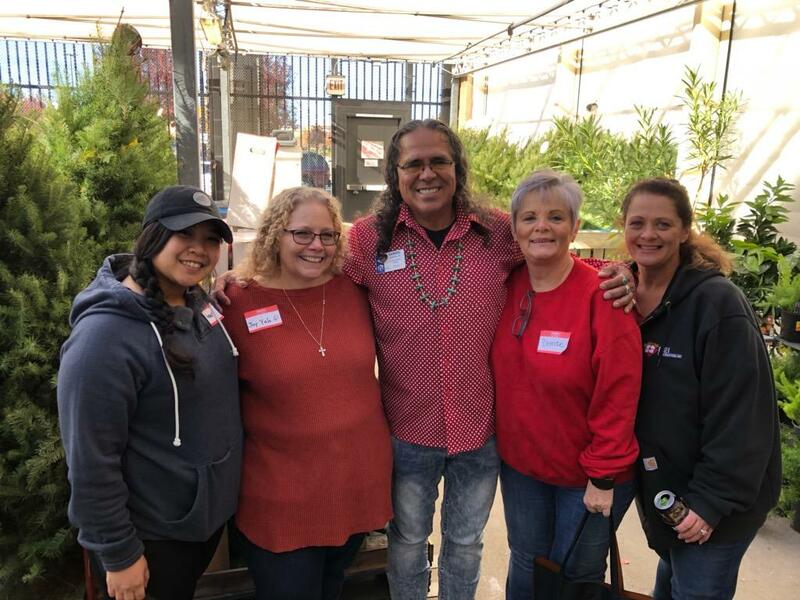 Members in attendance were Chuck Church, Sharon Freeman, Don Ryan, Tina Borzage, Janice Garcia, Gene Melchers, Charlene Melchers and Sam Garcia. 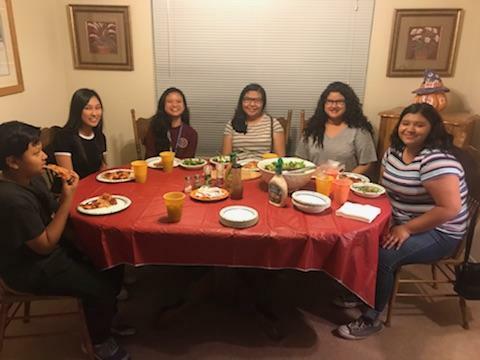 Everyone enjoyed dinner. The formal meeting began at 7:00 PM. Sam Garcia reviewed the weekly emails with the Club Members. Charlene sent an email searching for host families for visitors from Australia. Rooms for the night are needed. World Immunization Week is coming up the week of 24-30 April. Youth Protection Training for our Club is scheduled for April 17, 2019 at 6:30 PM at AVC. 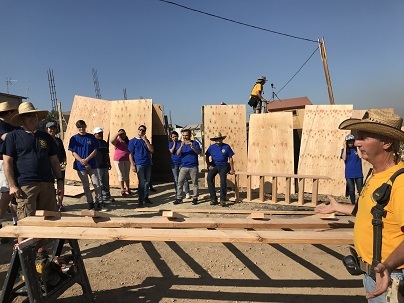 The Superbuild is scheduled for May 18, 2019. 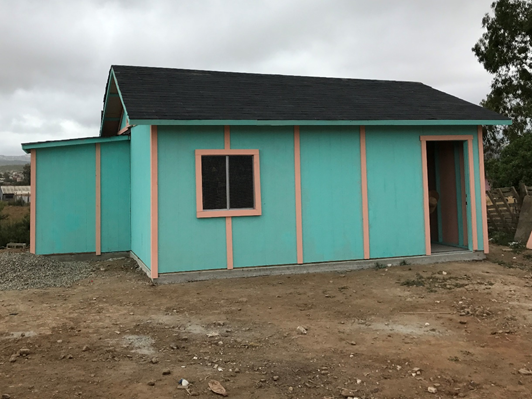 Two homes are funded and scheduled to be built on that date. 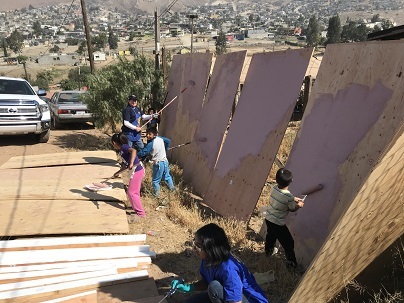 The By-Laws Committee met on April 8, 2019 and drafted the first 3 pages of the new By-Laws. Page 4 refers to Policies and Procedures and should involve very little editing. The remaining pages will be drafted at the next committee meeting. During Open Discussion it was decided that dues in the new Club would be $250 per year and that spouses would pay $150 per year. This will be put to a vote of the entire membership prior to the start of the new Club on July 1, 2019. 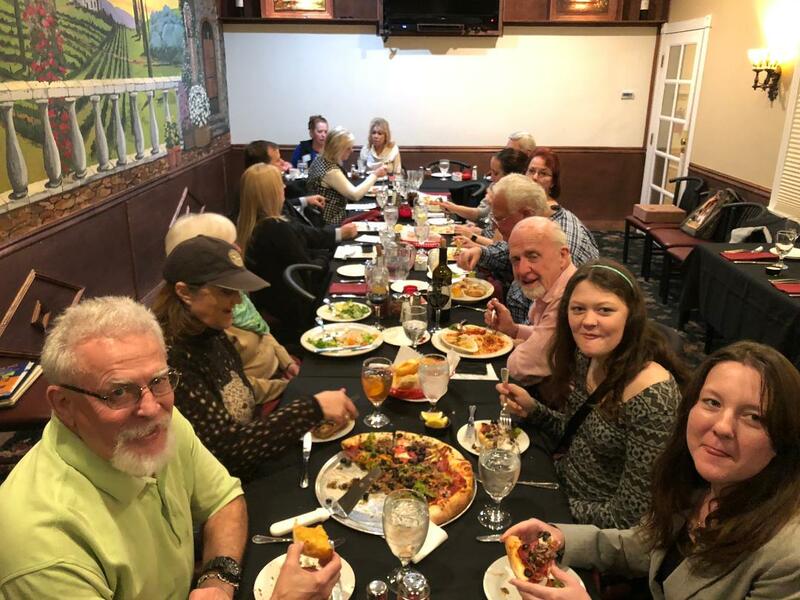 The Rotary Club of Palmdale conducted their weekly meeting at Gino’s Italian Restaurant in Palmdale on 6 February 2019. 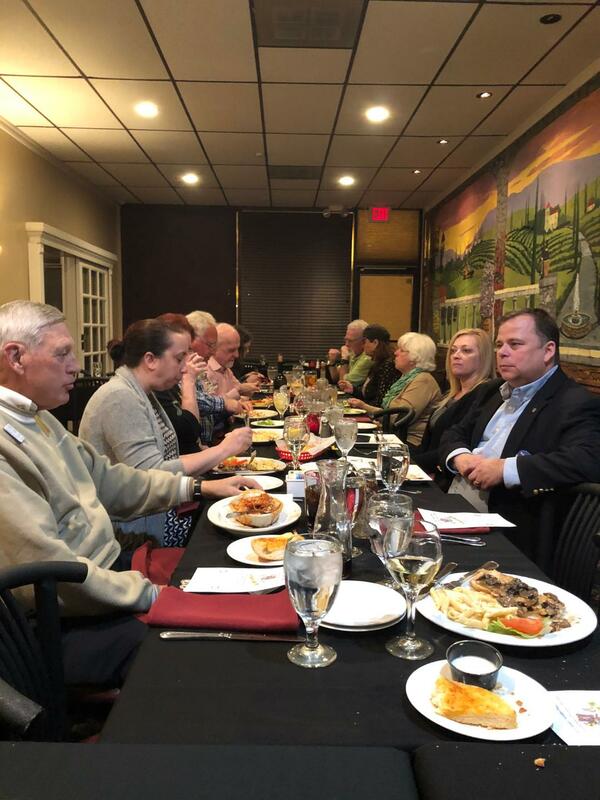 In place of the monthly Board Meeting on the first Wednesday of the month, the Club was proud to host our District 5300 Governor (John Chase) and his wife Elizabeth for their annual club visit. The meeting was called to order by President Sam Garcia at 6:35 PM. 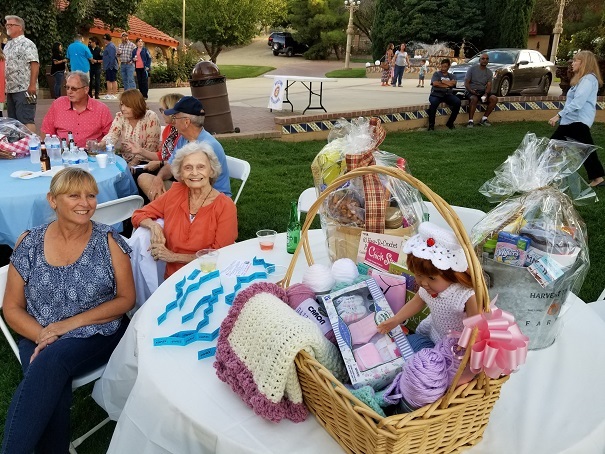 Members in attendance were Chuck Church, Janice Garcia, Sharon Freeman, Tina Borzage, Vickie Ryan, Don Ryan, Bernie Longjohn, Anne Longjohn, Charlene Melchers, Gene Melchers, Brandie Partello, special guests John and Elizabeth Chase and Sam Garcia. 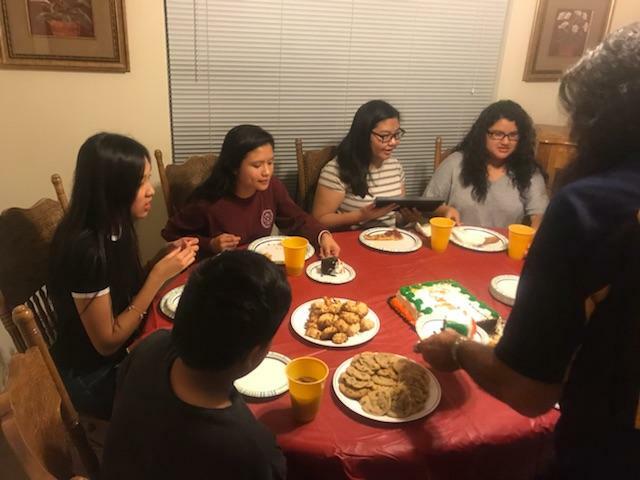 Everyone enjoyed dinner. The formal meeting began at 6:50 PM. 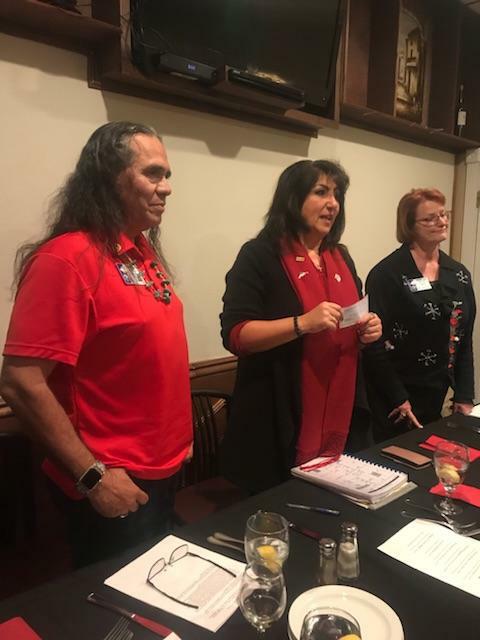 President Sam Garcia welcomed our guests John and Elizabeth Chase to the evening’s meeting. 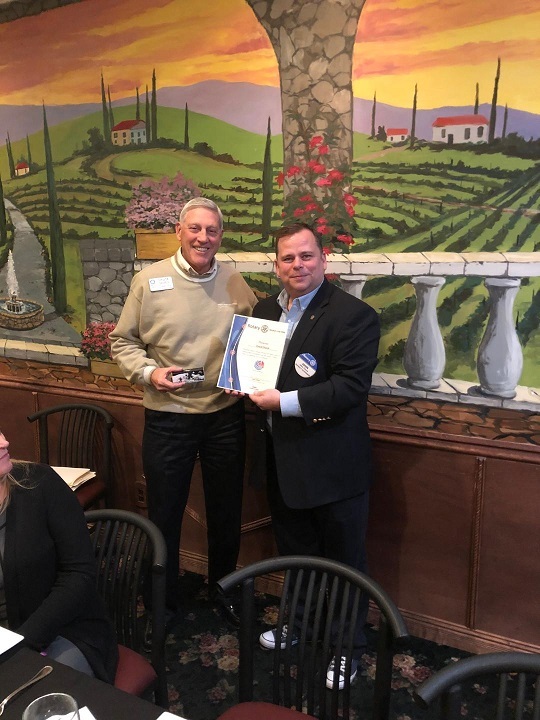 District Governor John Chase addressed the Club and discussed three main items of importance both for himself and for Rotary. 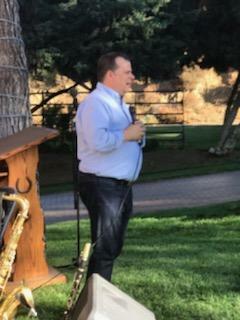 Governor Chase discussed the importance of membership to the future of Rotary and was excited to learn of the impending merger of three clubs in the Antelope Valley into one new club. Next, John touched on the ongoing effort to eradicate Polio. The disease is now present in only two countries Pakistan and Afghanistan. Rotary has made it a primary focus to eliminate this disease through the Polio Plus campaign. Finally, John touched on the Rotary Foundation (TRF). 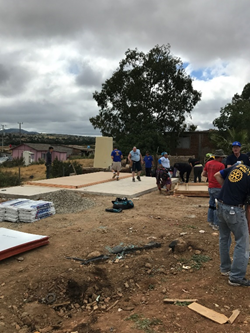 The Foundation is the backbone of Rotary’s effort to make the world a better place to live. 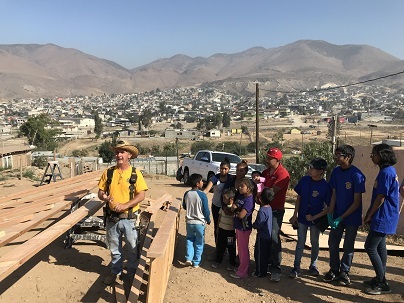 The Foundation supports International (Global) Grants between clubs from two or more countries on major projects and District Grants for local clubs on projects within their areas. After addressing the Club, John took questions from the floor and answered them to everyone’s satisfaction. 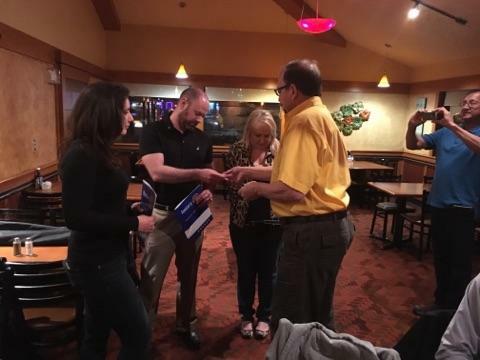 In conclusion, John presented two members with Certificates of Achievement for Rotary People of Action. The recipients were Gene Melchers and Chuck Church. 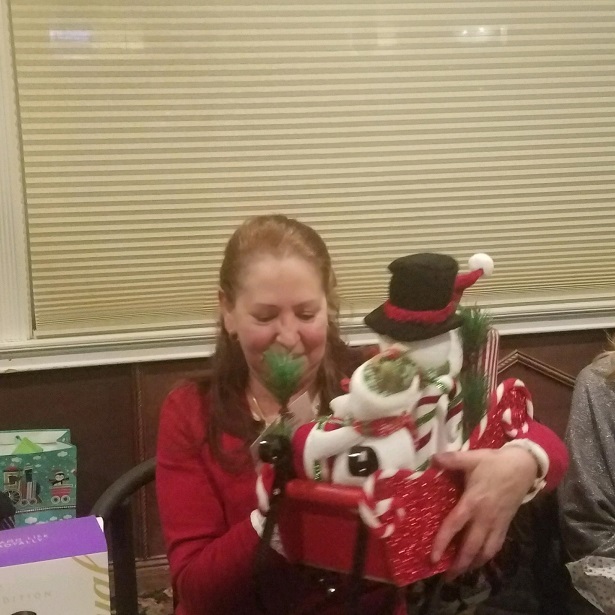 The Club Members presented John and Elizabeth with parting gifts. 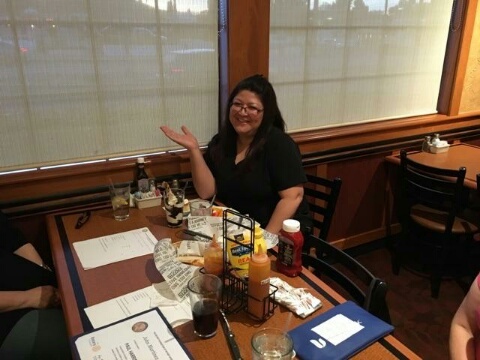 The next meeting of the Club will be on 13 February at Sizzler’s Restaurant in Palmdale. The Minutes and Treasurer’s Report for January will be reviewed at the March Board Meeting along with the Treasurer’s Report for February. 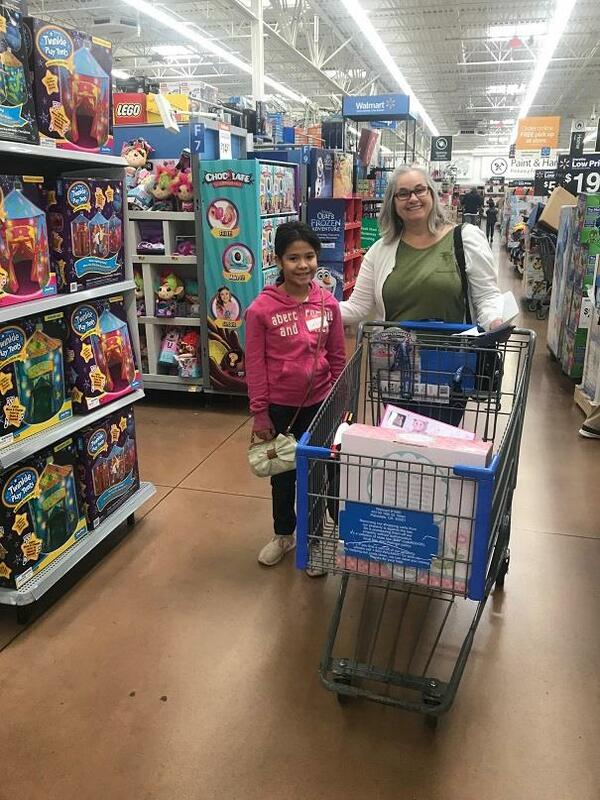 The Rotary Club of Palmdale conducted its’ 24th Annual Children’s Shopping Spree at the Walmart Super Center on 10th Street West in Palmdale on December 1, 2018. 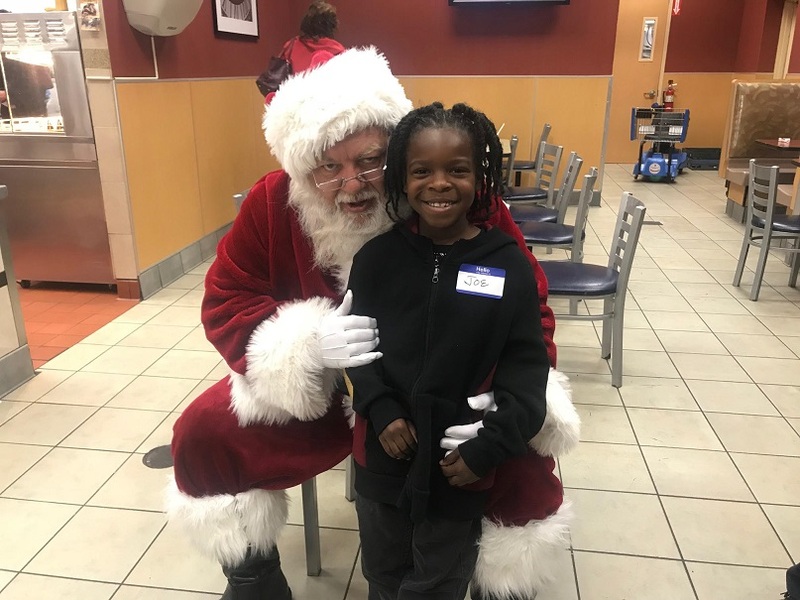 The Walmart Team and McDonalds provided the venue for twenty-three under privileged children from needy families to participate in the shopping spree. The children came from several local elementary schools. The students were selected by teachers from the local school districts and other youth leaders. 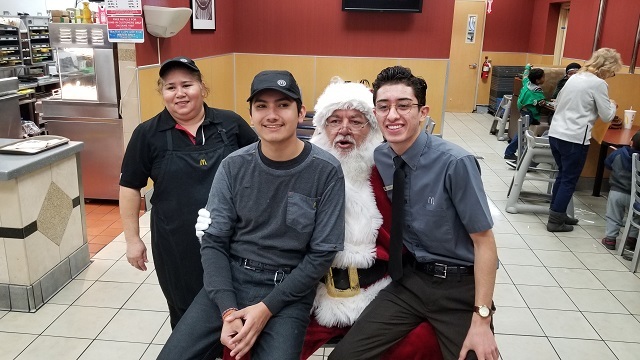 Each child was treated to an early morning breakfast at McDonalds inside the store and then escorted by a Palmdale Rotary Club Member or a volunteer teacher to shop throughout the store for gifts for their family members. 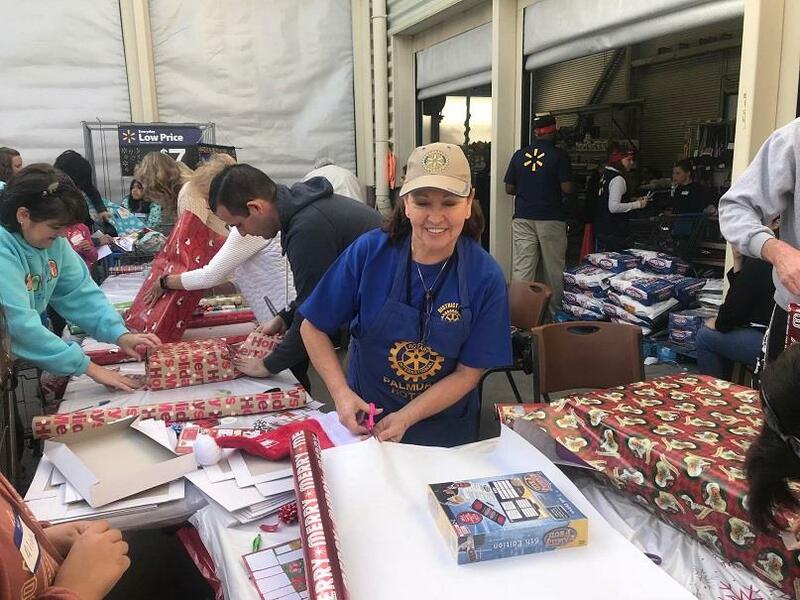 At the completion of shopping, the packages were all wrapped with bright and festive holiday wrapping paper and bows by the Palmdale Rotary Club Members, Volunteer Teachers and Palmdale Rotary Interact Club Members from Pete Knight High School for exchange with family members at Christmas. 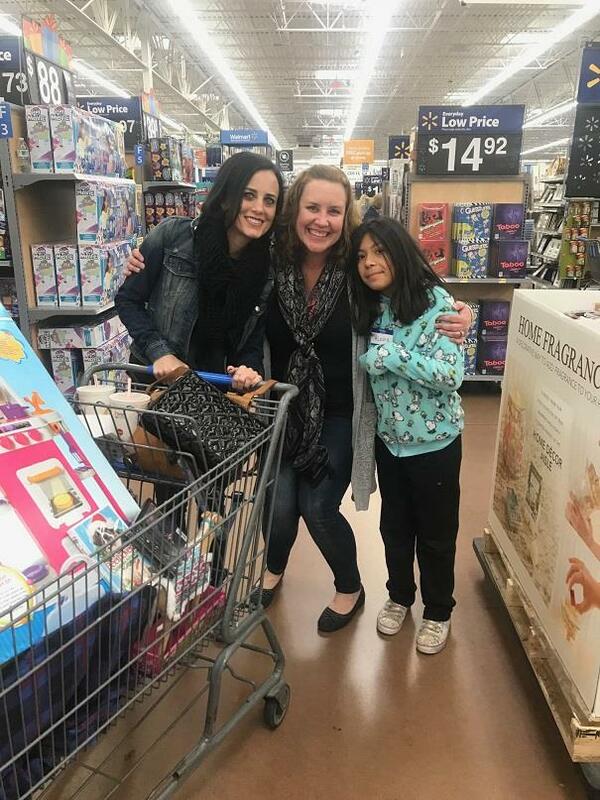 In addition, each child was given a gift card which they could use at the time or wait until after Christmas to select a gift of their choice. 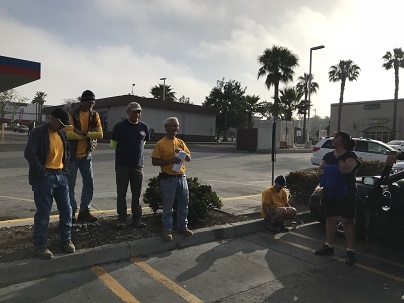 A big Thank You goes out to McDonalds and Walmart for their help and cooperation in making this event possible. 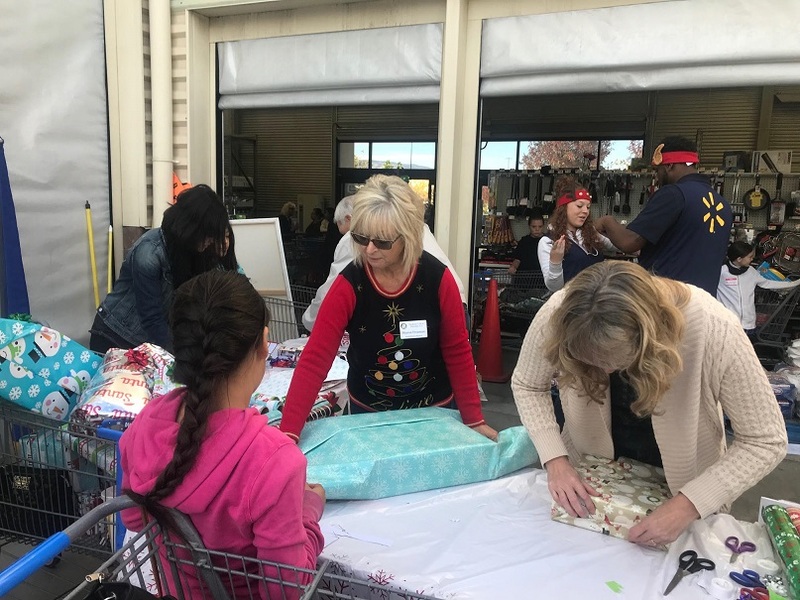 As always, the Rotary Club of Palmdale established two objectives for the shoppers: To learn to budget the funds provided to them and to better understand the meaning of the holiday season in which it is more rewarding to give than to receive. Those objectives were met again with joyous success. 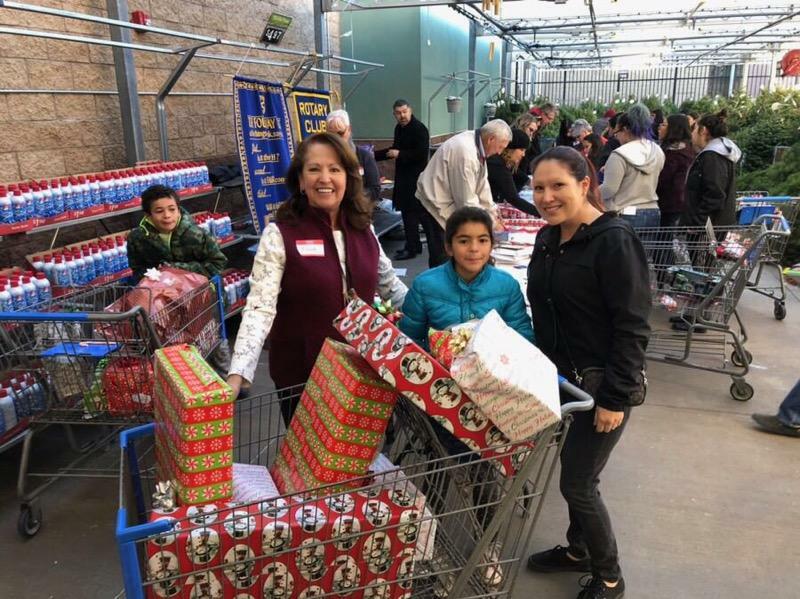 The Rotary Club of Palmdale under the leadership of Committee Chairman David Maddock conducted its 23rd Annual Children’s Shopping Spree at the Walmart Super Center on 10th Street West in Palmdale on December 2, 2017. 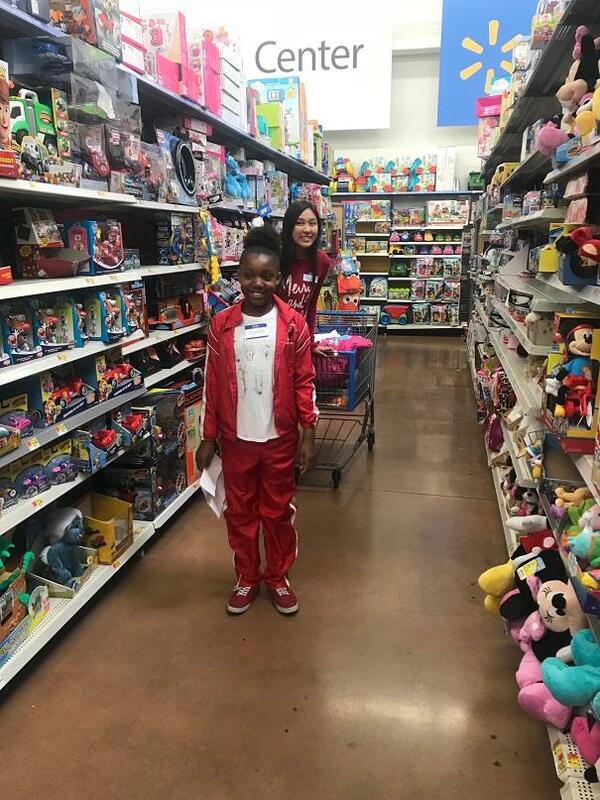 The Walmart Team provided the venue for twenty-four under privileged children from needy families to participate in the shopping spree. 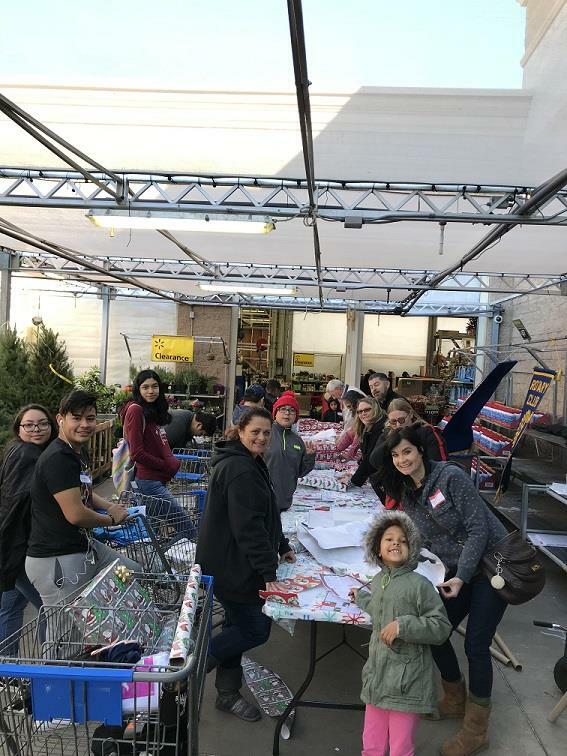 The children came from several local elementary schools. The students were selected by teachers from the local school districts and other youth leaders. 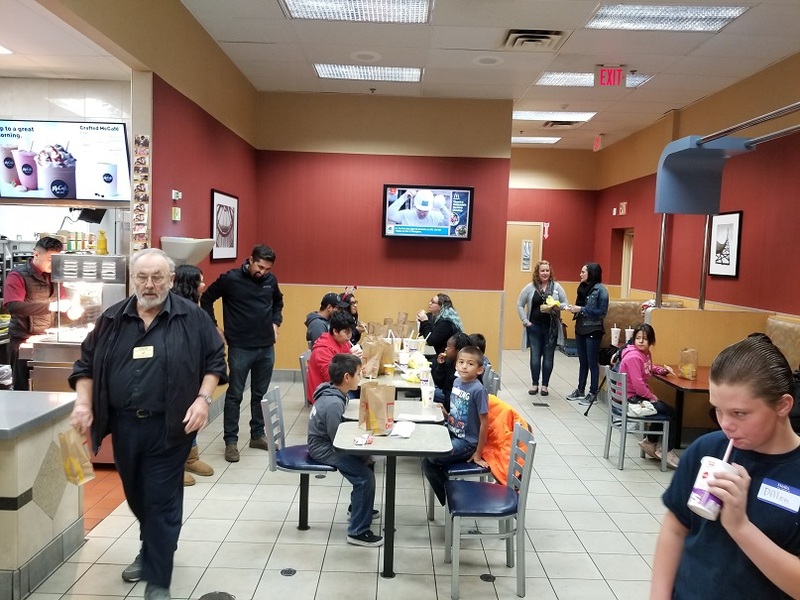 Each child was treated to an early morning breakfast at McDonalds inside the store. 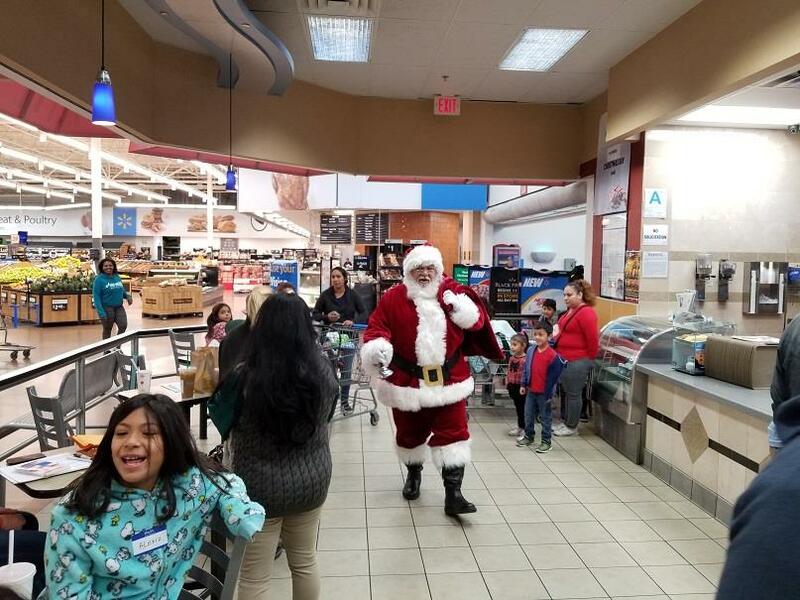 Next came a surprise visit from Santa Claus to hear the children's wishes. 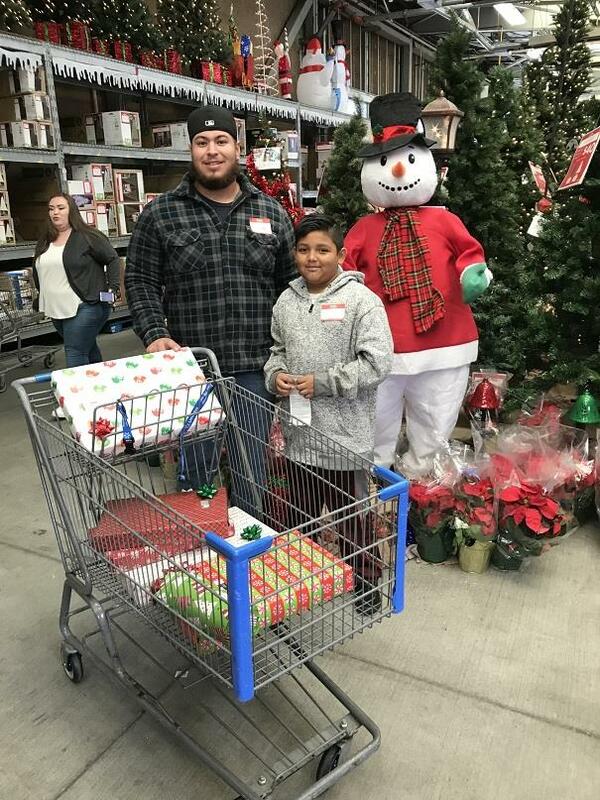 After pictures with Santa, the children were escorted by a Palmdale Rotary Club Member, a Knight High School Interact Club Member or a volunteer adult to shop throughout the store for gifts for their family members. 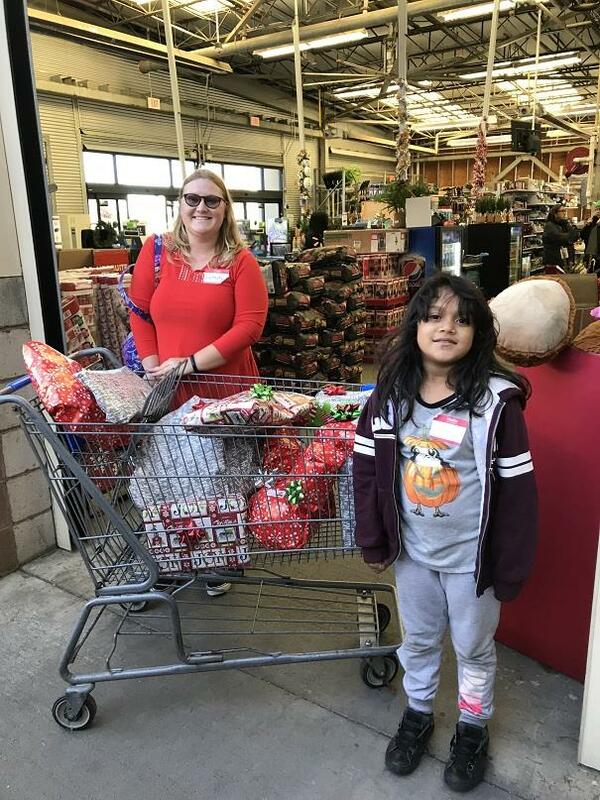 At the completion of shopping the packages were all wrapped with bright and festive holiday wrapping paper and bows for exchange with family members at Christmas. 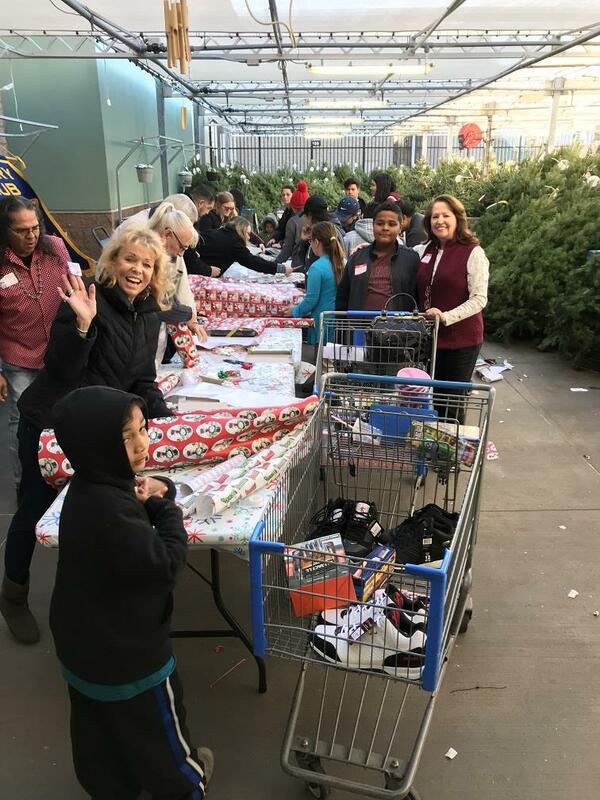 In addition, each child was given and gift card which they could use at the time or wait until after Christmas to select a gift of their choice. 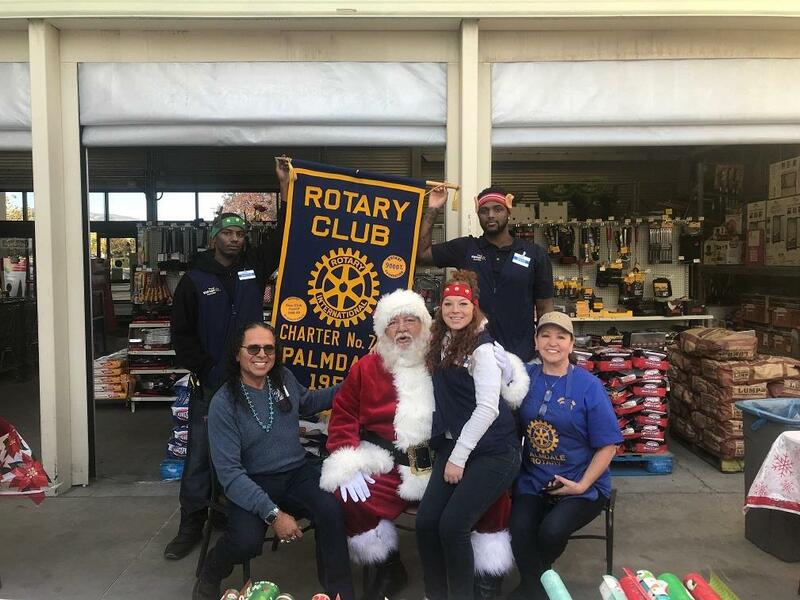 As always, the Rotary Club of Palmdale established two objectives for the shoppers: To learn to budget the funds provided to them and to better understand the meaning of the holiday season in which it is more rewarding to give than to receive. Those objectives were met again with joyous success. Now Its Time For Serious Shopping! 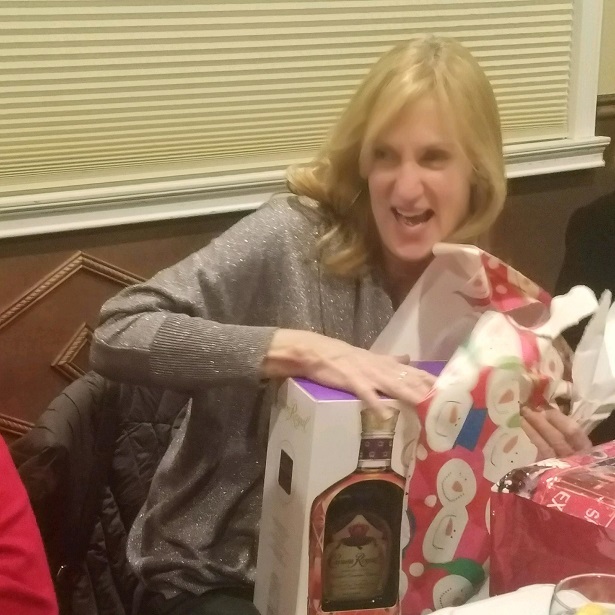 Selecting Gifts, What Do I Pick? Making Those Gifts Look Beautiful! And Finally, Its Done For Another Year! 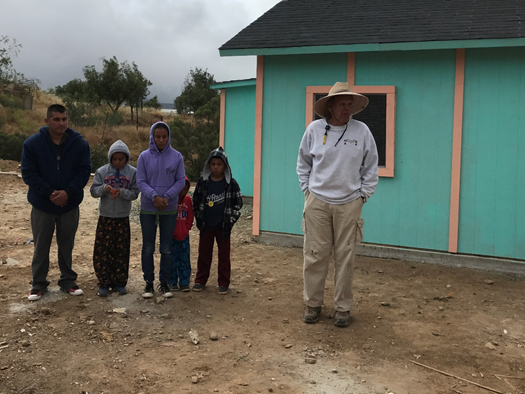 The Rotary Club of Palmdale sponsored the second of two assemblies for Special Needs Children in the Antelope Valley on October 9, 2017. 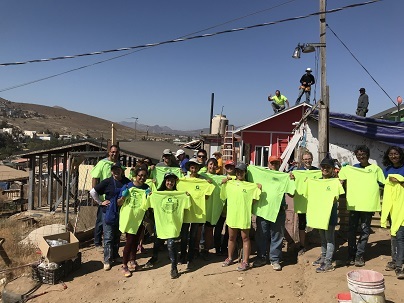 The assembly was held for the children of Manzanita Pre-School. 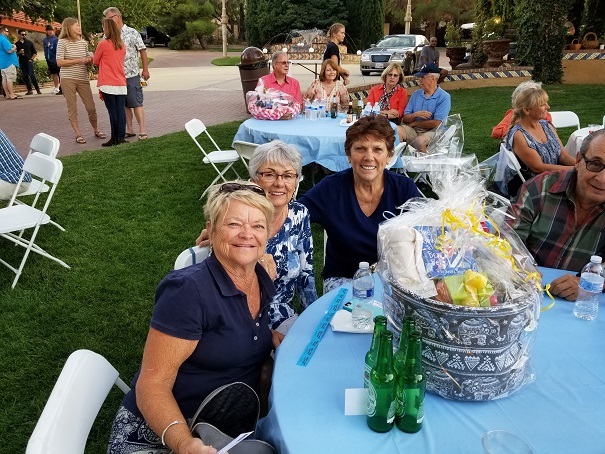 Sharon Freeman, Janice Garcia and Valerie Lensing attended the event. Both a morning and afternoon session were held to entertain the children. 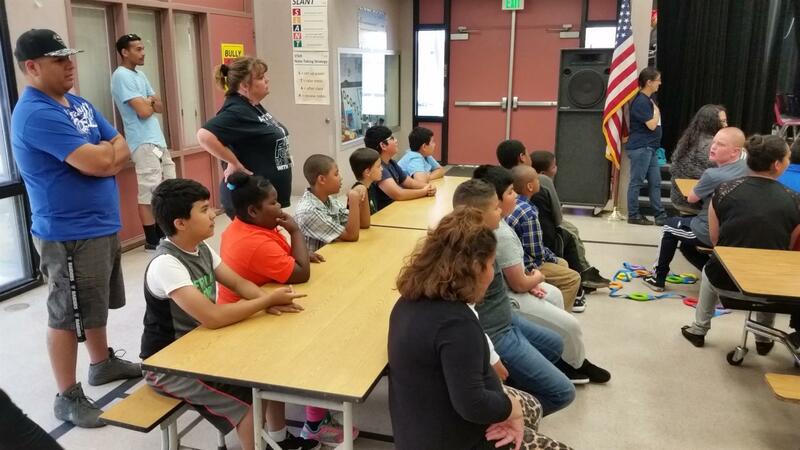 Principal Colleen Sawyer from the Palmdale Discovery Center was also in attendance. The Bubble Girl drew Oh’s and Awe’s from the kids as she started her routine. She then brought the children into the show with an interactive performance. 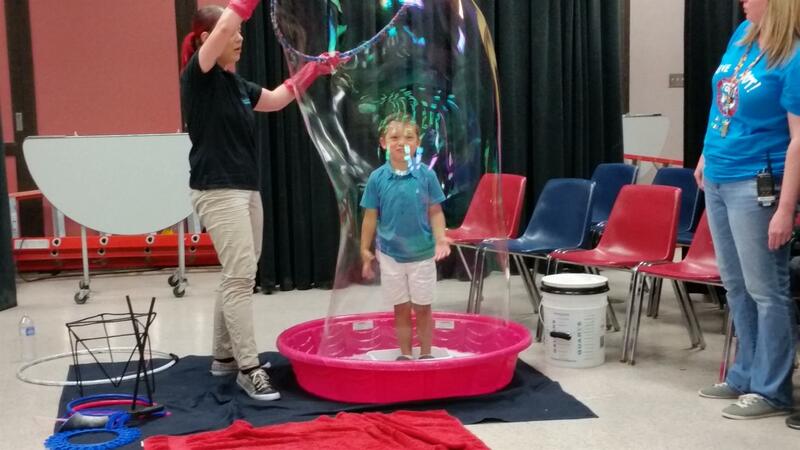 The children loved the show and were especially thankful that they were able to participate in the activities. 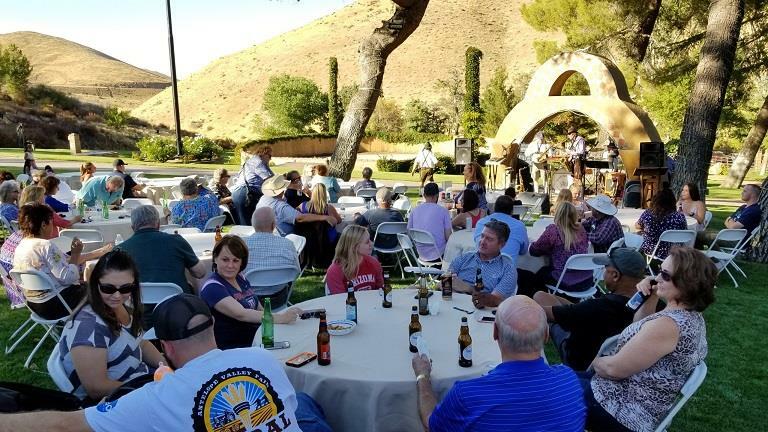 On a beautiful late summer afternoon, the Rotary Club of Palmdale hosted its 8th Annual Oktoberfest at Hacienda Lane Ranch in Palmdale. 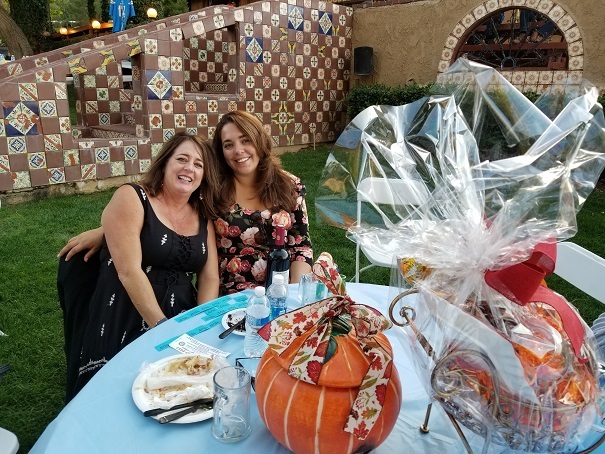 Over 130 guests attended the event and enjoyed the food, drink, music, fun, and raffles. 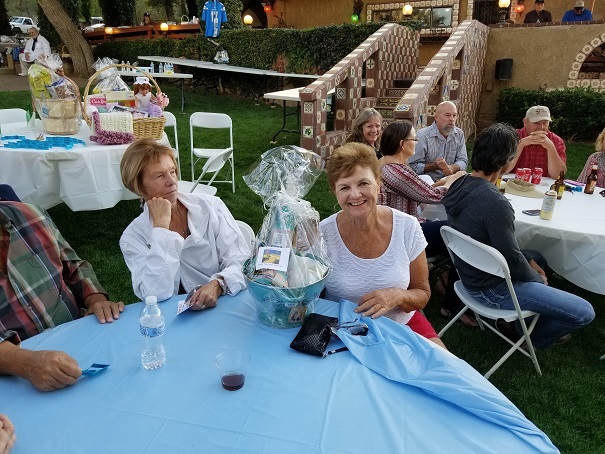 Frances Lane once again hosted the Oktoberfest at her beautiful ranch style home. 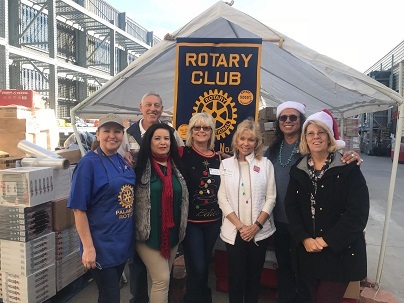 Besides local friends and neighbours of Palmdale Rotary Members, Rotarians from Lancaster, Rosamond and Santa Clarita joined in on the Festivities. 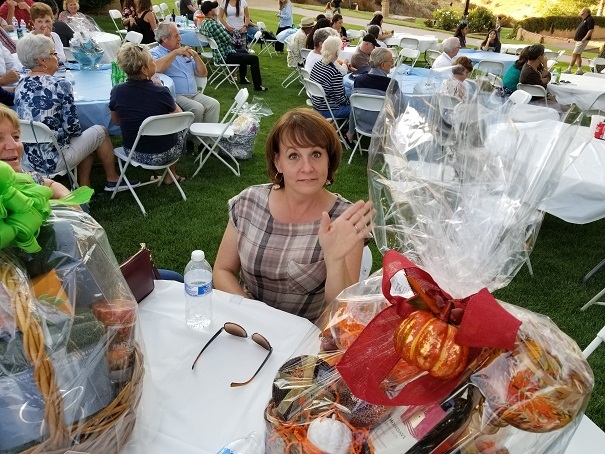 Our District 5300 Governor, Raghada Khoury, attended as was amazed at the beautiful setting and weather. 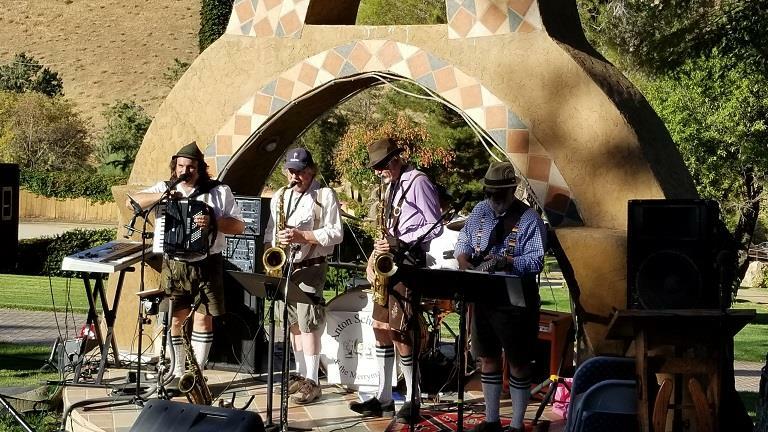 Entertainment was provided by Anton Schnitzel and the Merry Makers. 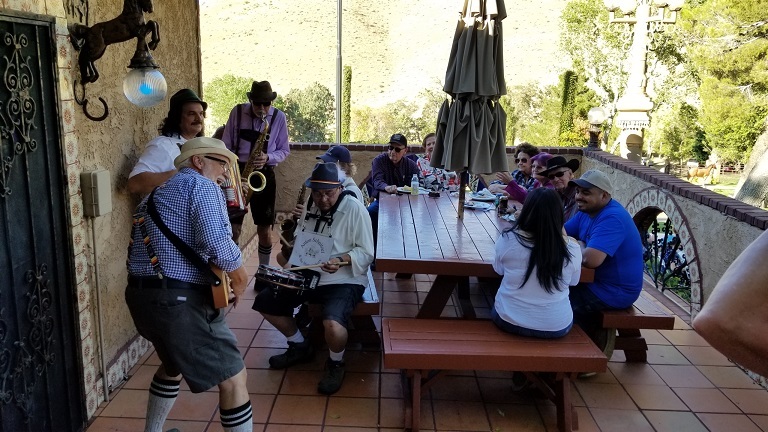 All the traditional polka songs and Oktoberfest music was enjoyed as well as a stirring rendition of the Chicken Dance and the Macarena. 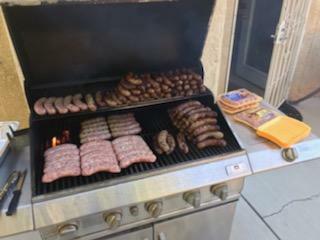 Food included roast pork, potato salad, sauerkraut, red cabbage, brats and of course German Chocolate Cake for dessert. 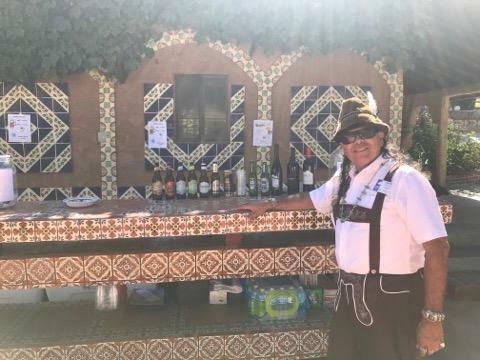 Several German Beers were available as well as wine, soft drinks, water and coffee. 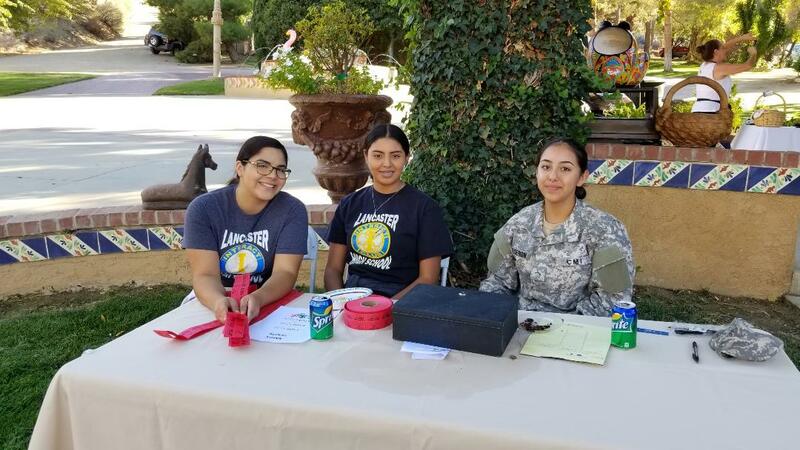 Barbara Frazier’s Lancaster High School Interact Club provided additional help by serving lunch, selling raffle tickets and distributing raffle baskets to the winning ticket holders. It was a fabulous afternoon of food, drink and fun. The pictures tell the whole story. Opppps, One Table of Non-Winners! 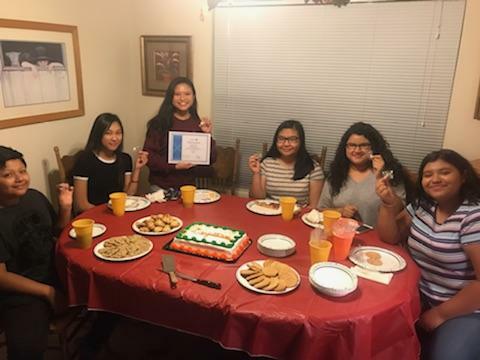 On August 30th, seven students from Knight High School and their Teacher/ Representative visited the weekly meeting of the Rotary Club of Palmdale to meet the current Rotary Club Members and introduce themselves as future members of the Knight High School Rotary Interact Club. Teacher Joy McCall and students: Louise Candeloza, Paola Sanchez, Monica Ayala, Ivy Ta, Marcia Sanchez, Mia Carranza and Argyu Mananjun met with Rotary Club Members: Sharon Freeman, David Maddock, Tina Borzage, Chuck Church, Janice Garcia, Yolanda Risch, Larry Flores and Sam Garcia to get acquainted begin the process of establishing an Interact Club at Knight High School. Guests Barbara Frazier, Luanne Arredondo and Holly Liebenow were also in attendance at the meeting. 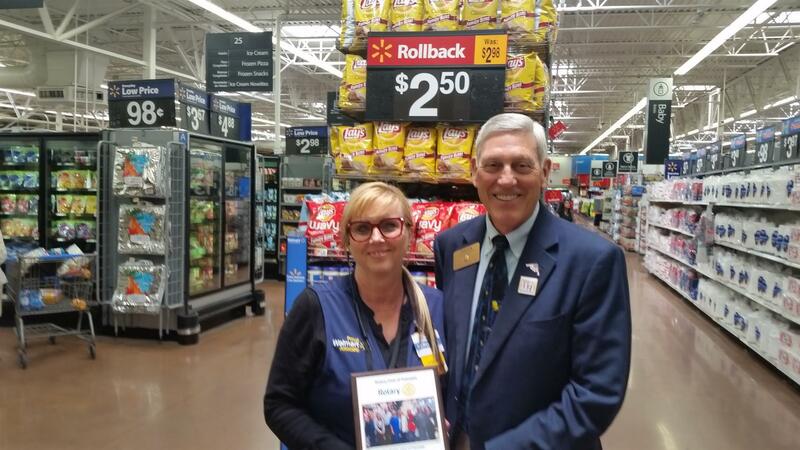 Barbara is the Teacher/Representative at Lancaster High School for the Interact Club at that school. She spoke to the students of her experience establishing and growing the Interact Club at Lancaster High. 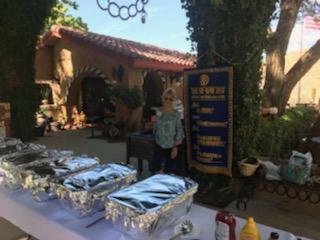 Barbara has been especially helpful to Palmdale Rotary in providing youth support to Palmdale Rotary events. 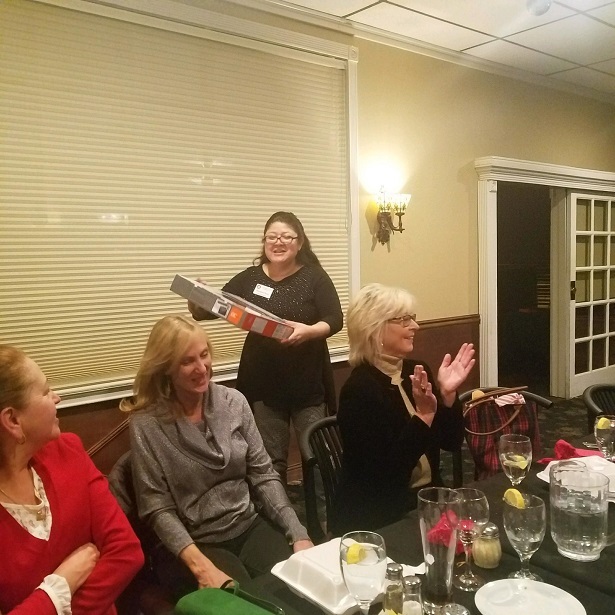 Luanne Arredondo spoke to the guests about the support on-line that Rotary provides to both new and existing Interact Clubs. Holly Liebenow was a guest of Sharon Freeman. 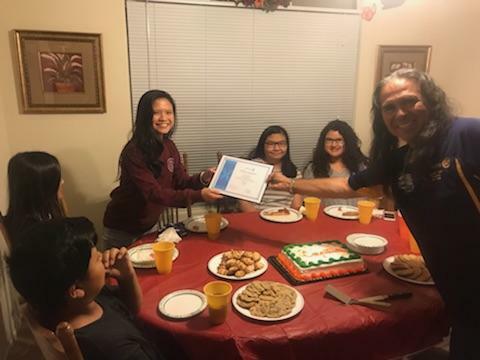 It was a great introductory kick-off to the establishment of the Knight High School Interact Club. 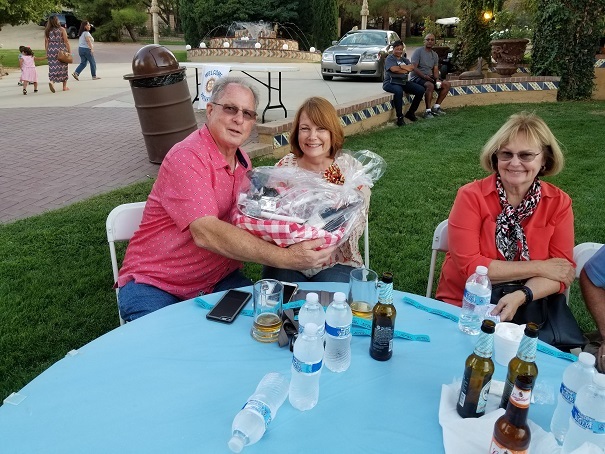 On Saturday, June 24, 2017 the Rotary Club of Palmdale held their annual Demotion Party for outgoing President Chuck Church at the home of Sharon Freeman. 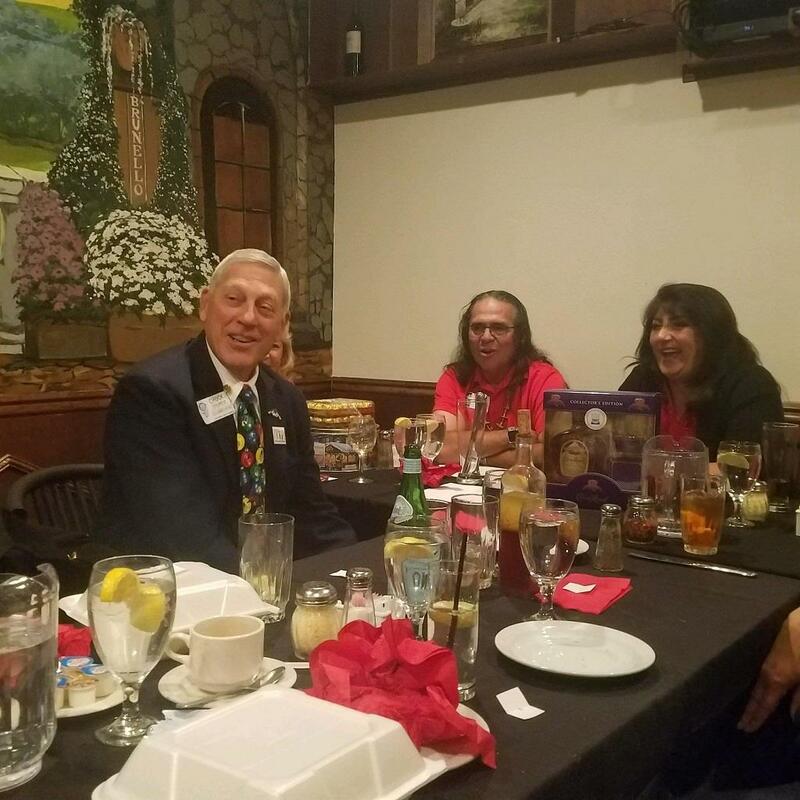 The event marked the end of Chuck’s year as President and the recognition of Sam Garcia as Incoming President for 2017-2018. Great food and drinks were in abundance at the party. 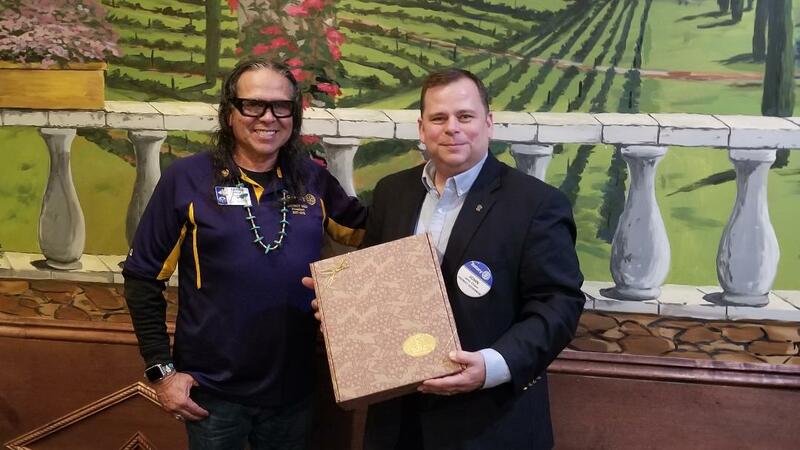 After lunch Chuck was presented with a plaque of appreciation from the Members of the Rotary Club of Palmdale by Incoming President, Sam Garcia. Sam spoke to the Club Members and Guests about his vision for the Club for 2017-2018. 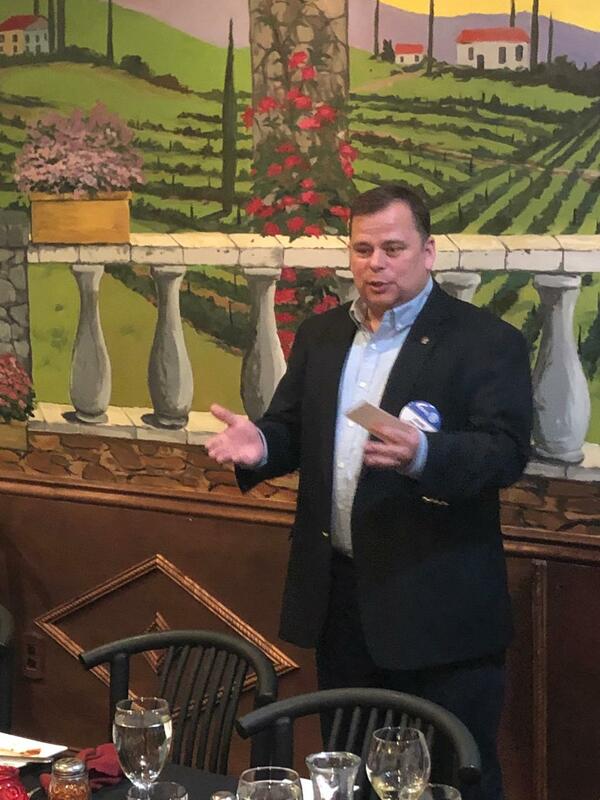 Outgoing President Chuck Church then spoke and thanked everyone for attending and thanked the Club Members for their support during the year. 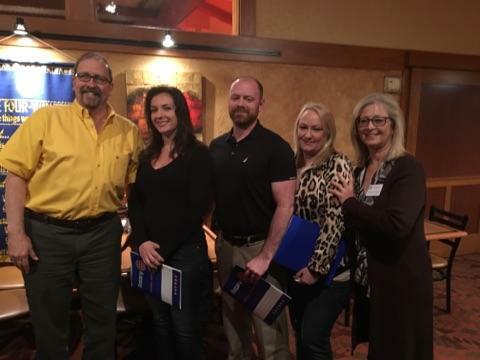 Chuck then presented Club Members Sharon Freeman, David Maddock, Tina Borzage, Janice Garcia and Sam Garcia with Certificates of Appreciation and gifts for their efforts in 2016-2017. Sharon’s Certificate was for Membership and Youth Service Chair, David’s Certificate was for Community Service Chair and Sergeant-at-Arms, Tina’s Certificate was for Club Treasurer, Janice’s Certificate was for Club Secretary and Sam’s Certificate was for Foundation Chair and President Elect. 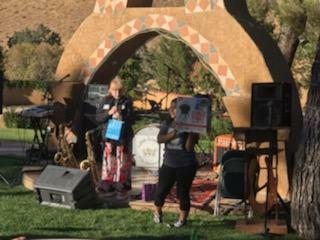 Chuck was also presented with a Certificate of Recognition from 5th District Supervisor Kathryn Barger. Senior Field Representative Donna Termeer presented the Certificate to Chuck on behalf of Supervisor Barger. Following the speeches and presentations everyone had dessert and sang “Songs we all know” with Olaf Landsgard leading the way on guitar. It was a great time and everyone enjoyed the afternoon. 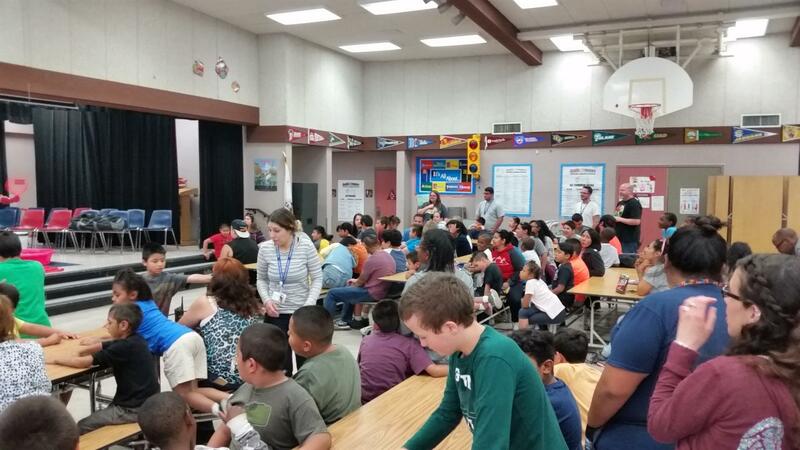 The Rotary Club of Palmdale sponsored the first of two assemblies for Special Needs Children in the Antelope Valley. 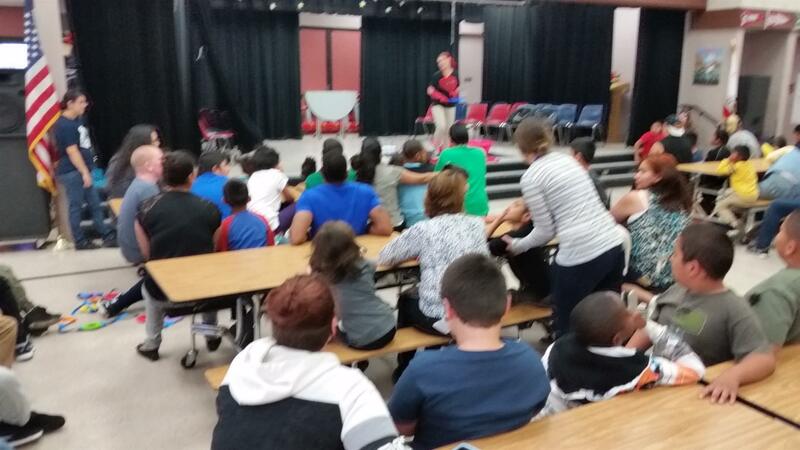 Today’s assembly was held for the children of the Palmdale Discovery Center at Ocotillo Elementary School. 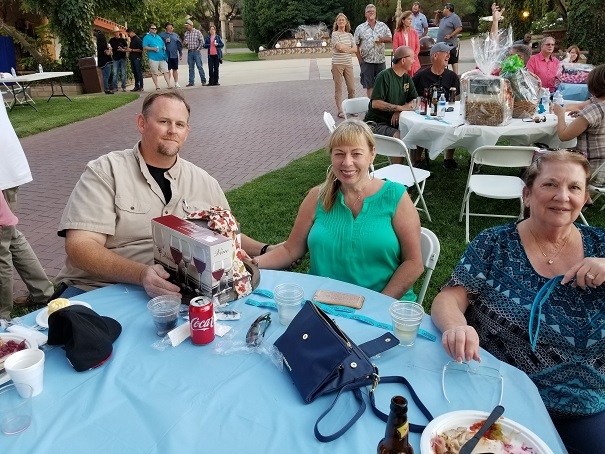 Chuck Church, Janice Garcia and Sharon Freeman attended the event and were escorted to the Assembly room by school principal Colleen Sawyer. 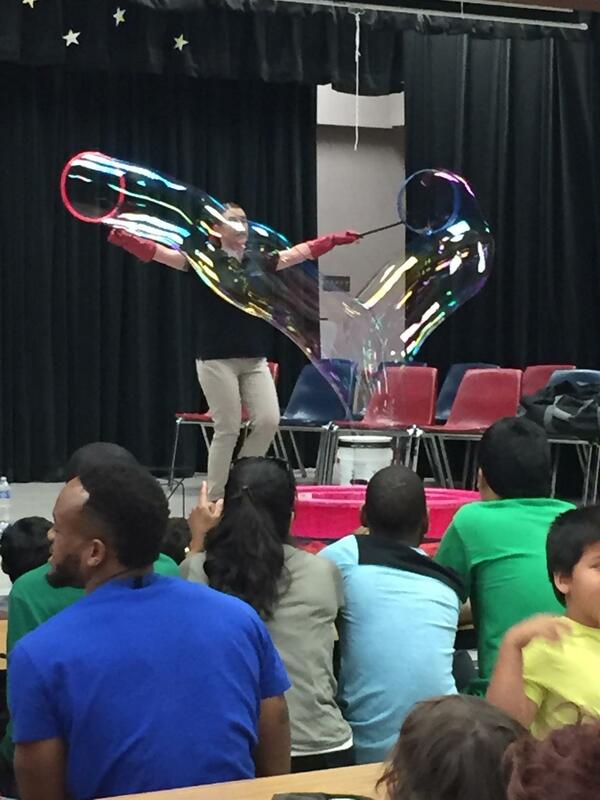 Over 100 kids were entertained by Marcie the Bubble Girl. She drew Oh’s and Awe’s from the crowd as she started her routine. 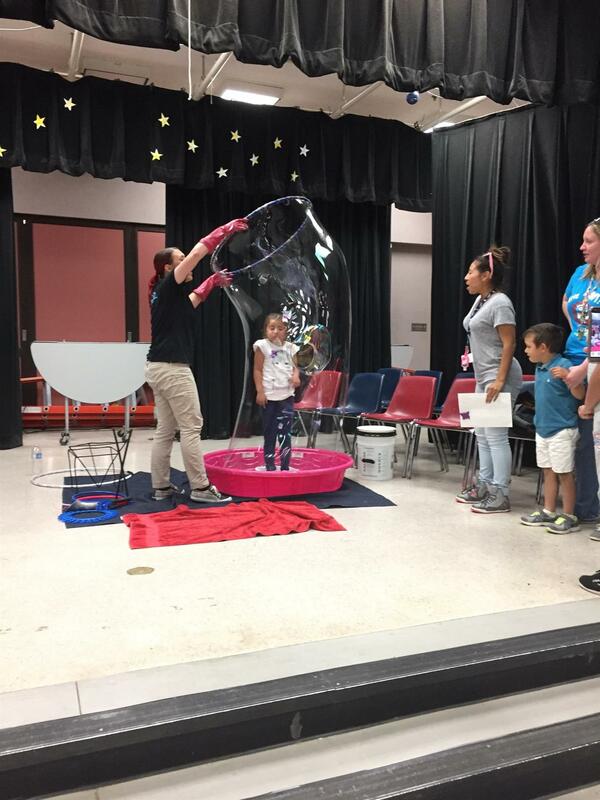 Marcie started with small bubble tricks and displays and gradually escalated to bubbles measuring three feet in diameter. 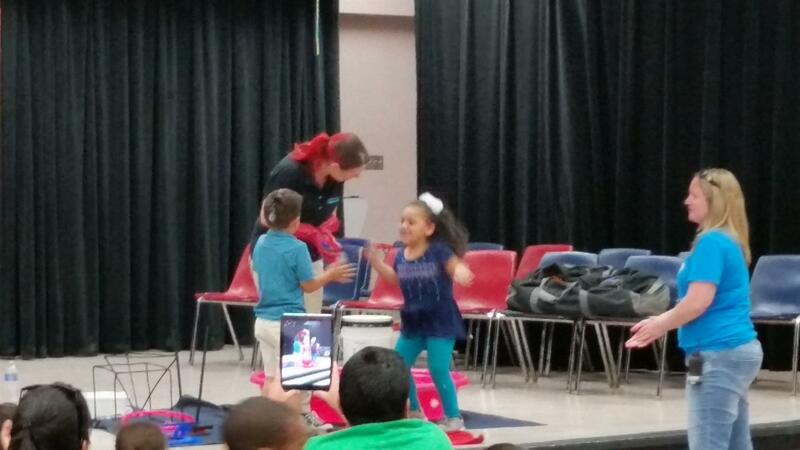 Kids from the audience were asked to help out on stage as the program progressed. Marcie’s final display was to fully engulf the kids in a balloon. 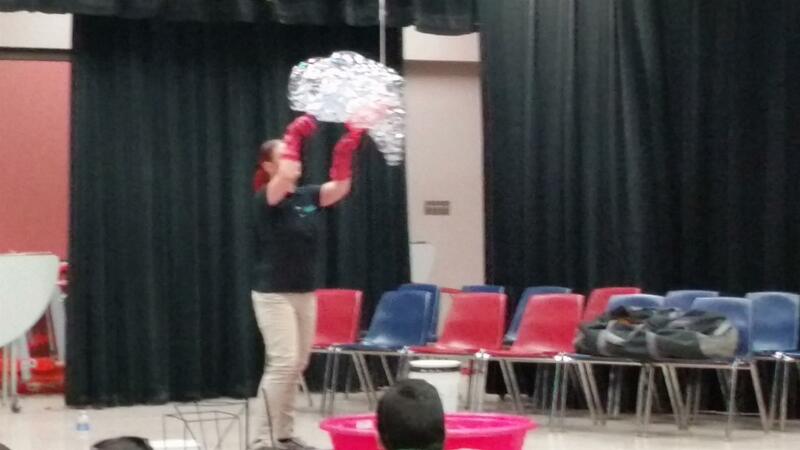 The kids loved the performance and they got a bubble crown before returning to their classrooms. For the children, this was a stress free fun time in which the children were able to interact with the Marcie on stage. 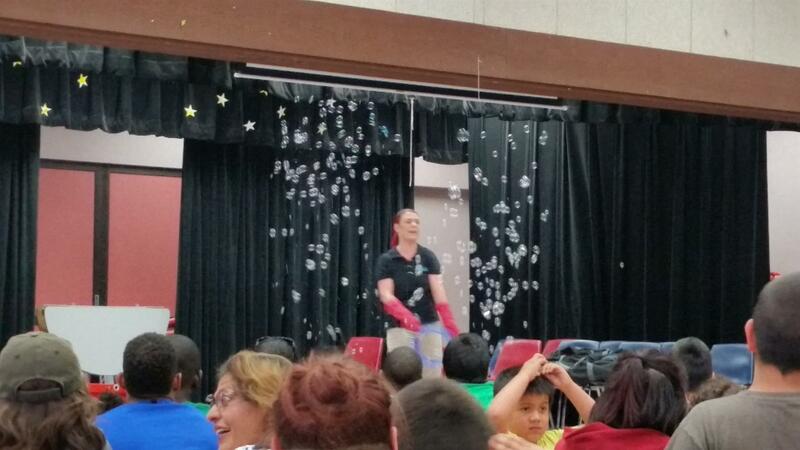 The next performance will be at the Manzanita Elementary School in the Fall to kick off the new school year in August or September. 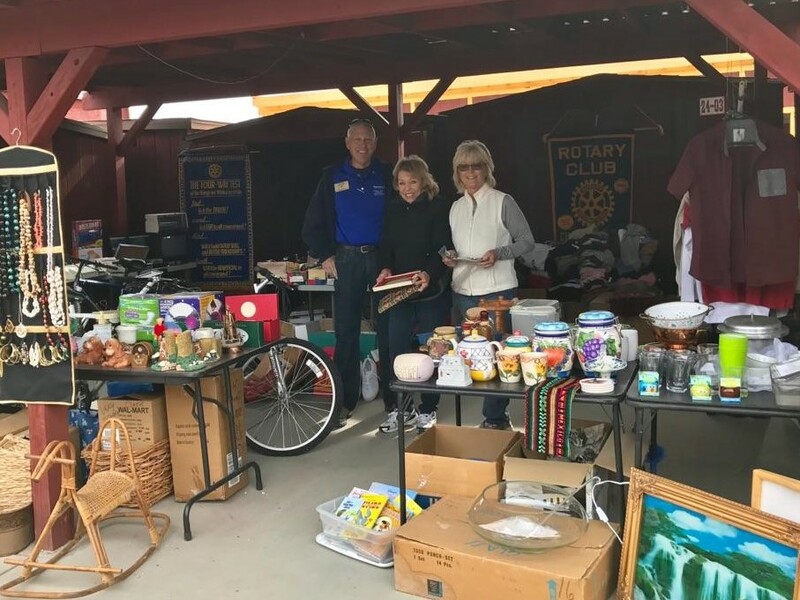 The Rotary Club of Palmdale held their 3rd Spring Blowout Sale fundraiser at the Four Points Swap Meet on Sunday, April 9th. 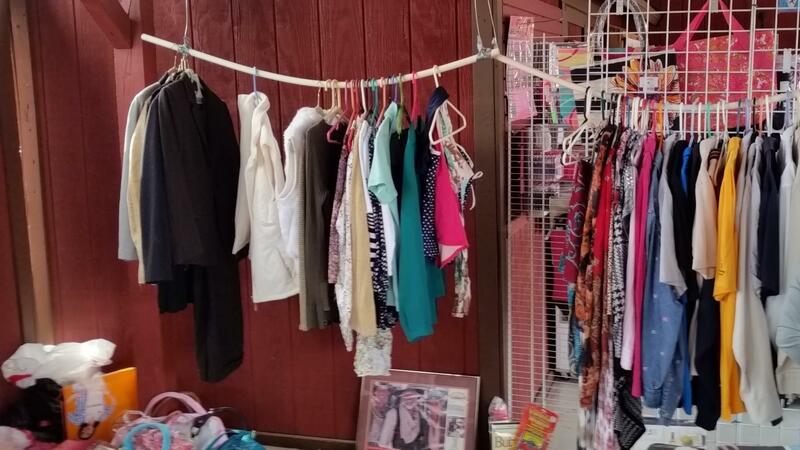 Everything imaginable was available at the rummage sale that day from stereo equipment to knick-knacks to used clothing. The swap meet draws a large Sunday crowd every weekend and this was no exception. 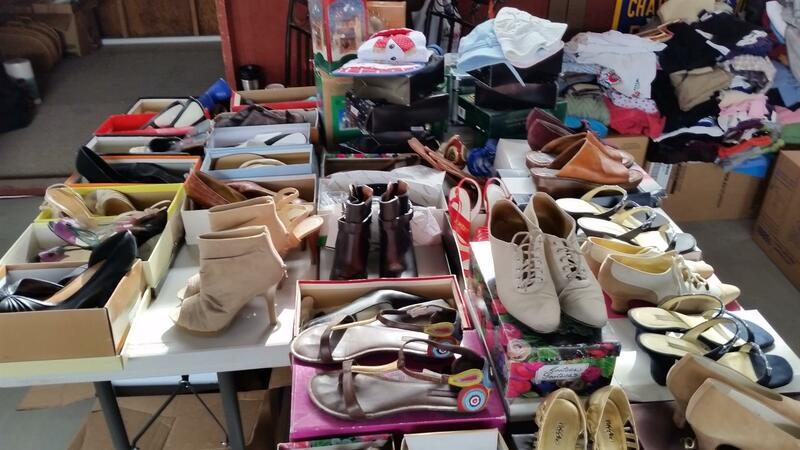 After a slow start, lookers became buyers and the Club was busy with sales until late afternoon. 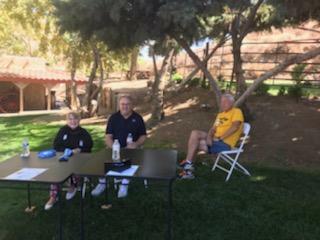 The results exceeded expectations and the Club looks forward to next year's sale. 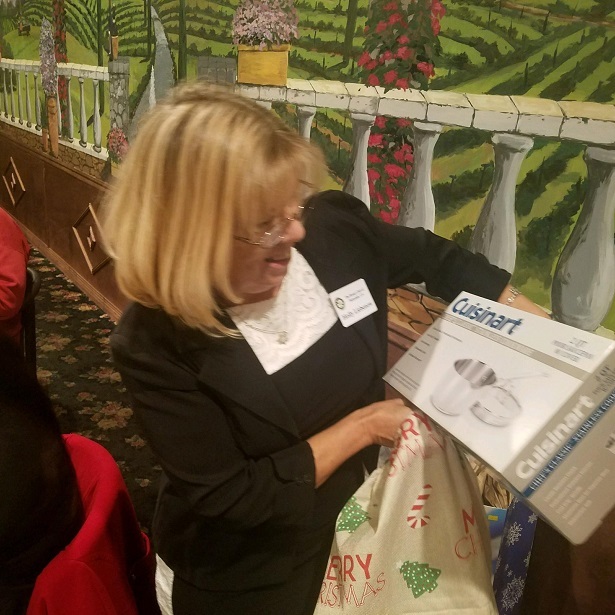 The Rotary Club of Palmdale hosted Donna Termeer as their guest speaker at their weekly meeting on January 25, 2017. 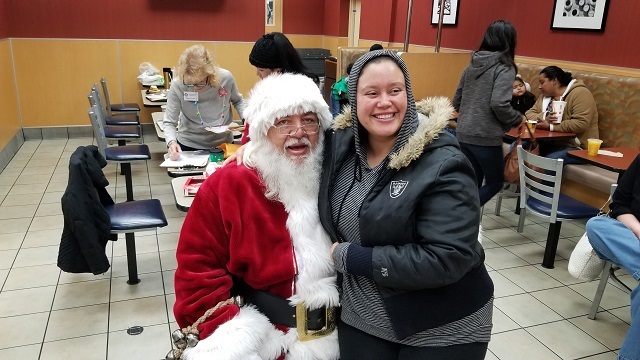 Ms Termeer is the Senior Field Director for recently elected Kathryn Barger (Supervisor for the 5th District in Los Angeles County). 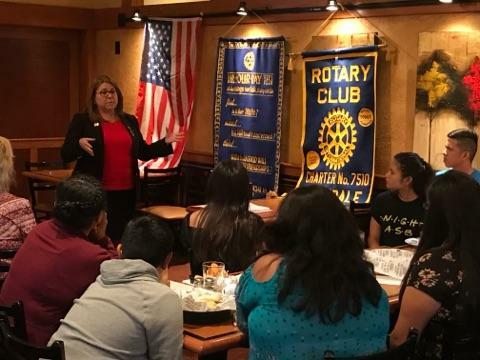 Donna spoke to the Club about her new assignment and what lies ahead for the Antelope Valley. Although very well known in the AV, Donna is still meeting with all the agencies in the AV to coordinate their goals and concerns to report back to Supervisor Barger. 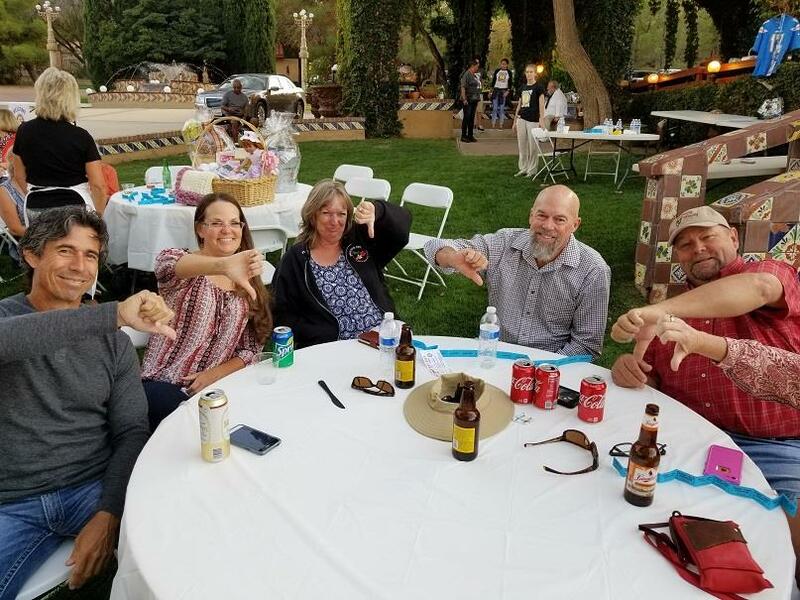 Donna indicated that with Supervisor Barger being the only conservative on the Board of Supervisors, it may be difficult to achieve large break throughs immediately. Being in a 4-1 minority, the victories will be small and selective in the beginning. The Club presented their views on several subjects pertaining to the AV. 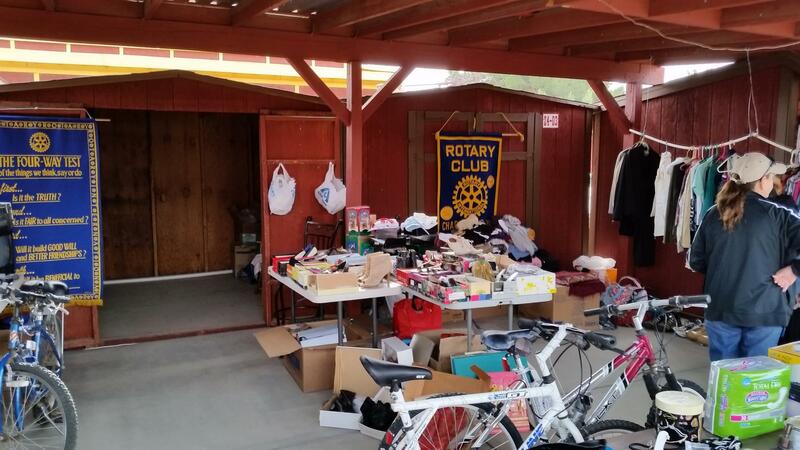 The Club asked Donna to watch for areas in which Palmdale Rotary could help the community. 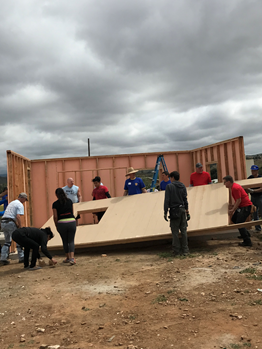 The Club's focus has mostly been on youth oriented projects, but we are open to ideas where we can help out the community. 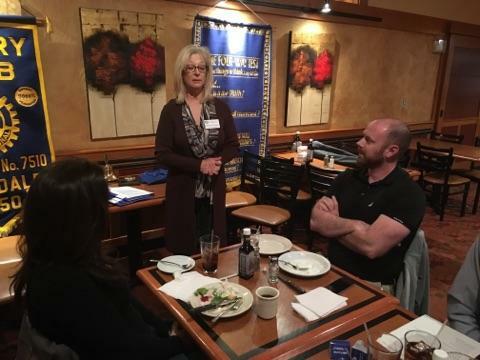 Valerie Lensing addressed the Rotary Club of Palmdale at their weekly meeting on November 30, 2016. Valerie is a Special Education Instructor and Therapist for Autistic Children. 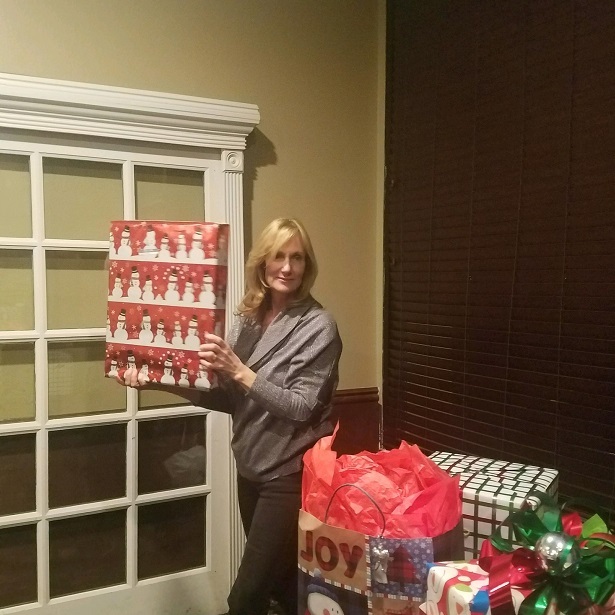 Valerie briefed the Club on her work with special needs children at Manzanita School and the Palmdale Learning Center. 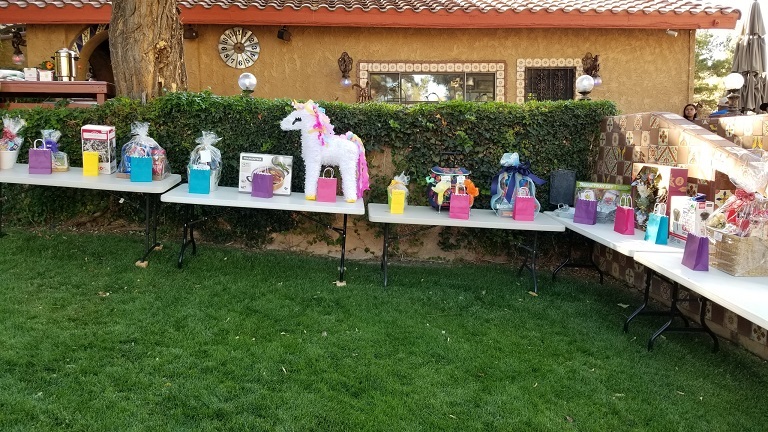 A few years ago the Palmdale Rotary Club sponsored a petting zoo for the children that Valerie coordinated. 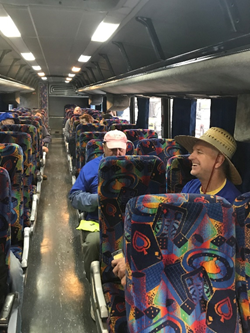 Because of their special circumstances, it is easier to bring a field trip to the children than to charter a bus or van and take them on a traveling field trip. With that thought in mind, Valerie’s current focus for the children is to bring them an entirely new field trip event. 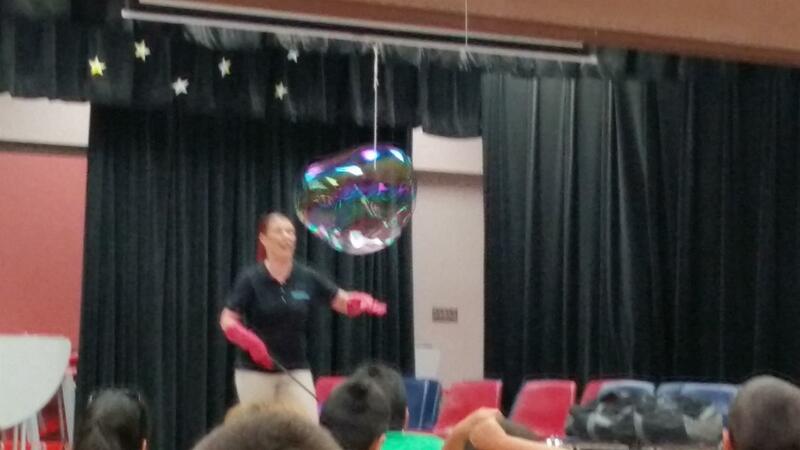 The kids are very interested in bubbles and are fascinated by the way they float and drift with the wind. 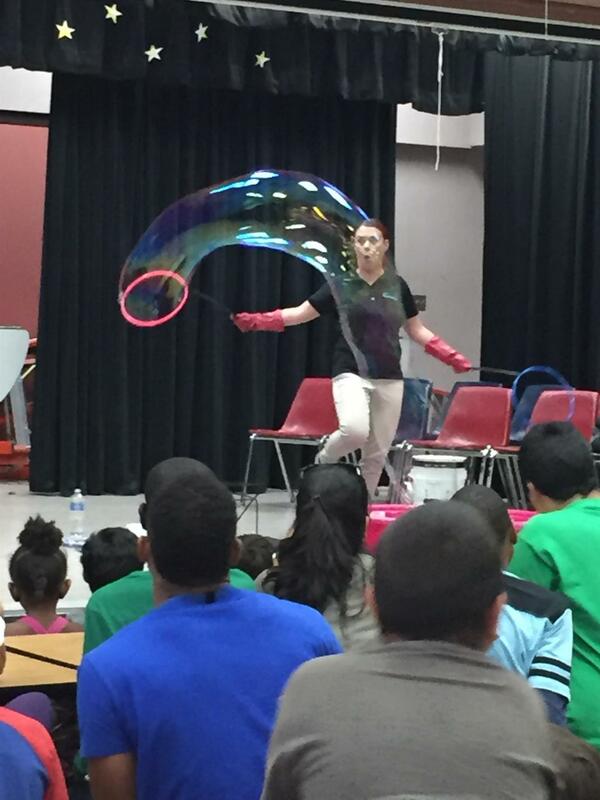 With that thought in mind, Valerie is entertaining the idea of bringing a Master Bubble Blower to the two school campuses to entertain the children. Valerie has arranged for two events in the Spring of 2017 and is asking the Club if they could fund some of the cost. The cost for doing two events at two schools is approximately $800. The Club has taken it into consideration for funding at least one of the events. 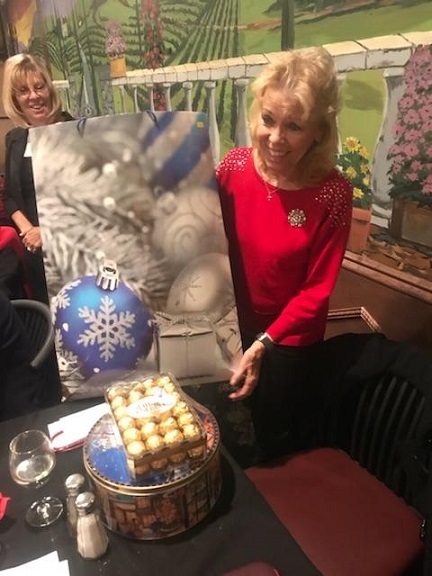 At the conclusion of her presentation, Valerie was presented with a Certificate of Appreciation from the Club for her briefing as guest speaker. 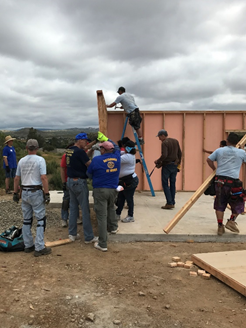 Eagle Scout candidate Aaron Turk briefed the Palmdale Rotary Club on the successful completion of his Eagle Scout project at their weekly meeting on November 9, 2016. 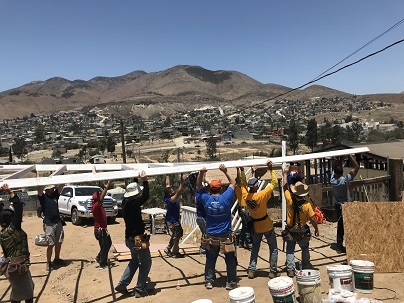 Aaron's project was to paint and trim the offices at the Grace Resources Center in Lancaster. 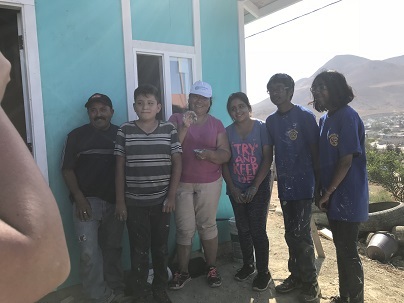 Aaron was responsible for obtaining the equipment and supplies to do the painting, scheduling the date for the project, coordinating activities among the staff at the Center and his supporting scouts and of course participating in painting the office. The project went smoothly and was successfully completed. 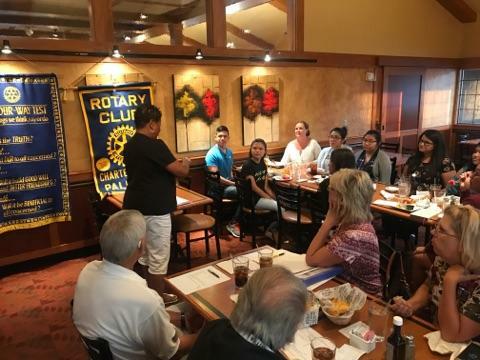 The Palmdale Rotary Club asked Aaron to speak to his scout troop and remind them to come to us for help when planning their Eagle Scout projects. Aaron is only a few merit badges away from obtaining his Eagle Scout Award. 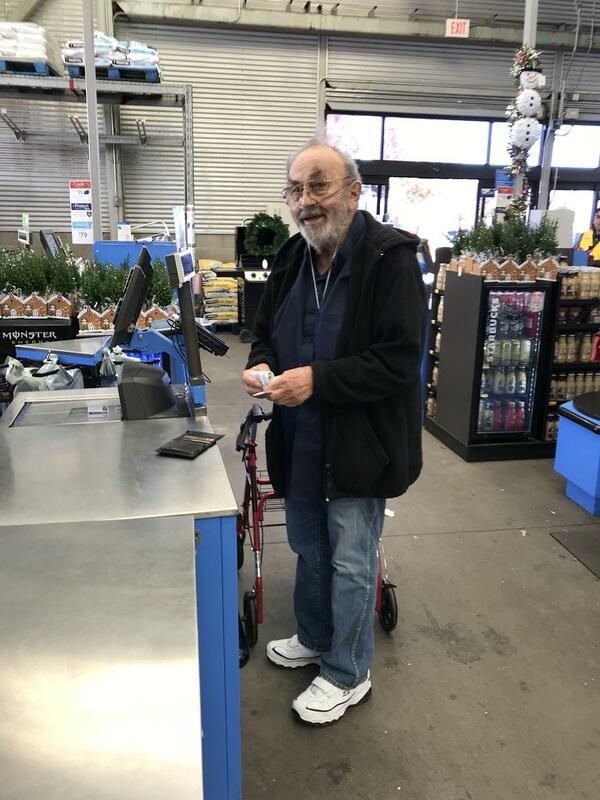 We asked him to notify us when he completes his tasks and is scheduled for Court of Honor to receive his Eagle Scout Award. Job well done Aaron! 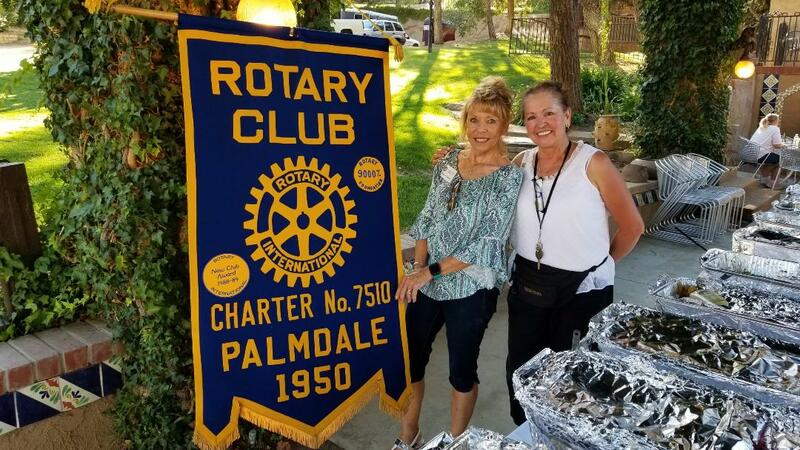 At its regular Wednesday evening meeting, Palmdale Rotary met with Pauline East from the Los Angeles County Animal Shelter Foundation to find new ways to support activities in the Antelope Valley. 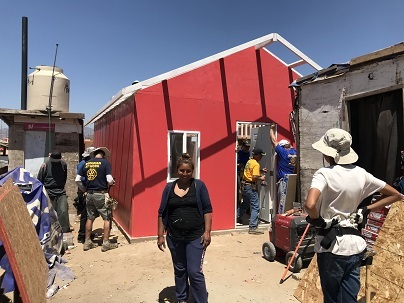 In her presentation, Pauline described the work her foundation does to support the newly constructed animal shelter in Palmdale, California and the other five shelters in Los Angeles County. 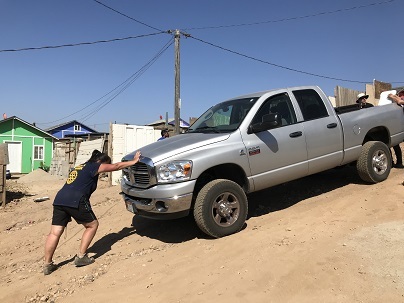 The primary concern in working with the County is to help find homes for the animals and work to get lost pets back to their owners. Although the shelter does an excellent job with the budget it is provided by the County, the number of incoming animals far out weighs the outgoing adoptions, resulting in a budgetary shortfall. 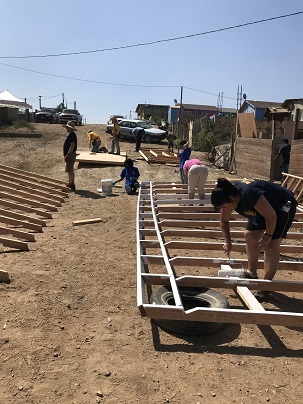 The Foundation is focusing on education, training and information directed specifically at children regarding spay and neutering as the downstream means to reduce the influx of new animals coming into the shelter. 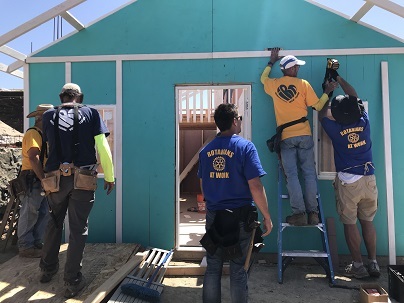 Palmdale Rotary will continue to remain in close contact with Pauline and the Foundation in hopes of creating a joint project that we can work on together in the near future. Our thanks to Pauline for her informative presentation. 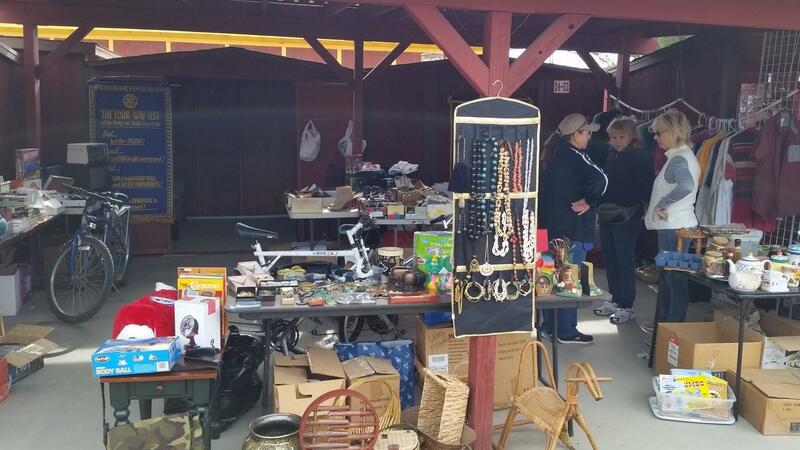 The Rotary Club of Palmdale held their 2nd Spring Blowout Sale fundraiser at the Four Points Swap Meet on Sunday, April 17th. Everything imaginable was available at the rummage sale that day from stereo equipment to knick-knacks to used clothing. The swap meet draws a large Sunday crowd every weekend and this was no exception. Funds raised from the event will be used to support the Rotary Foundation. Come and Get It, Before We Throw It Out! 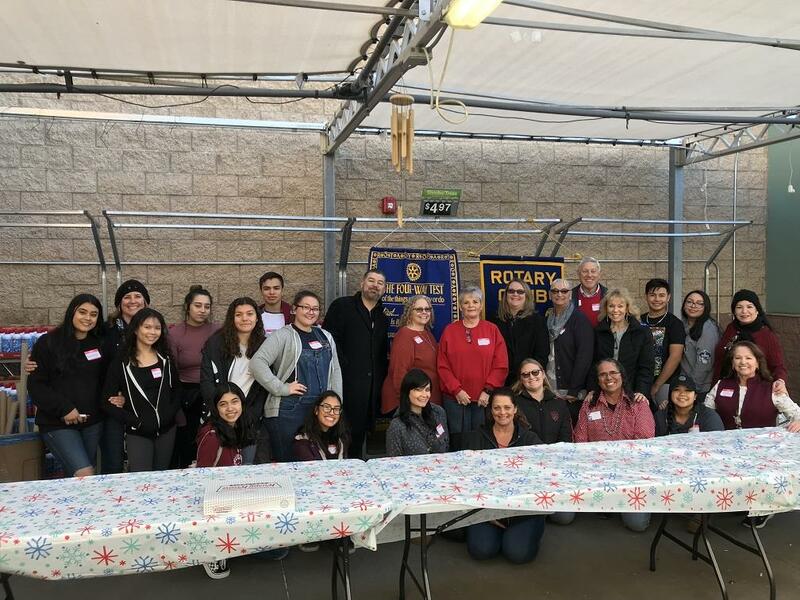 In a project that began last summer, the Rotary Club of Palmdale added a new chapter on March 13, 2016 with the delivery of an upright piano to the Antelope Elementary School in Littlerock. 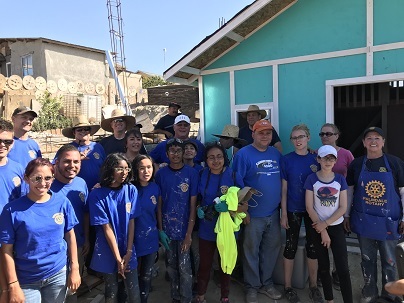 During the summer, Palmdale Rotary took on the project of creating a music program at the elementary school. 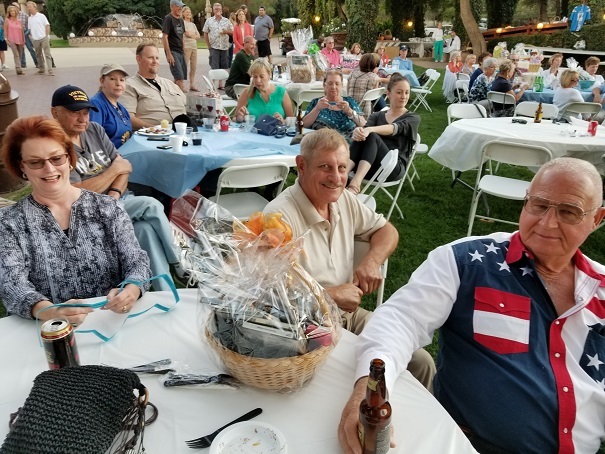 The Club conducted a special raffle at their Oktoberfest event at Lane Ranch and raised $1,000 which went to the purchase of musical instruments from Dana Grossi Music and Guitar Center. The instruments were purchased and delivered to the school in January 2016. 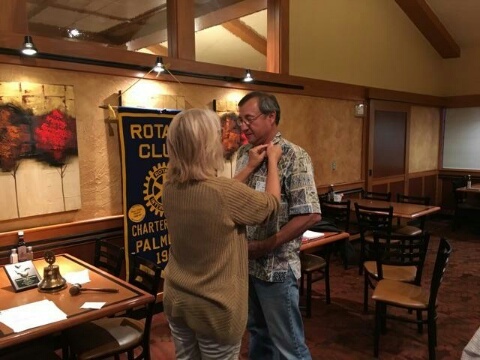 A special ceremony took place on January 21, 2016 at the School District's Board Meeting to thank Palmdale Rotary. 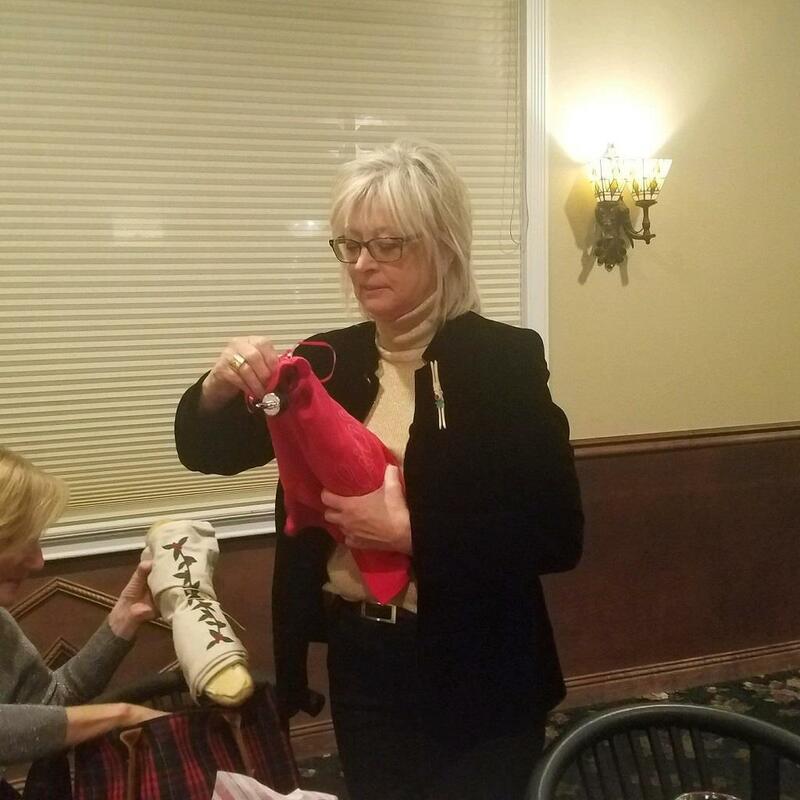 Club President Sharon Freeman accepted a plaque presented by the School Board and the entire Club received hand made thank you cards from the students. 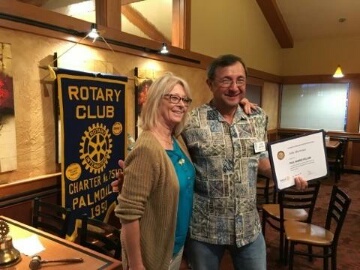 In addition, Palmdale Rotary presented a check to the school to help fund a music instructor for the first quarter of the year. On March 13, 2016 the Club was able to deliver a piano which had been donated to the program. The Club is actively working on plans for future contributions to the music program. 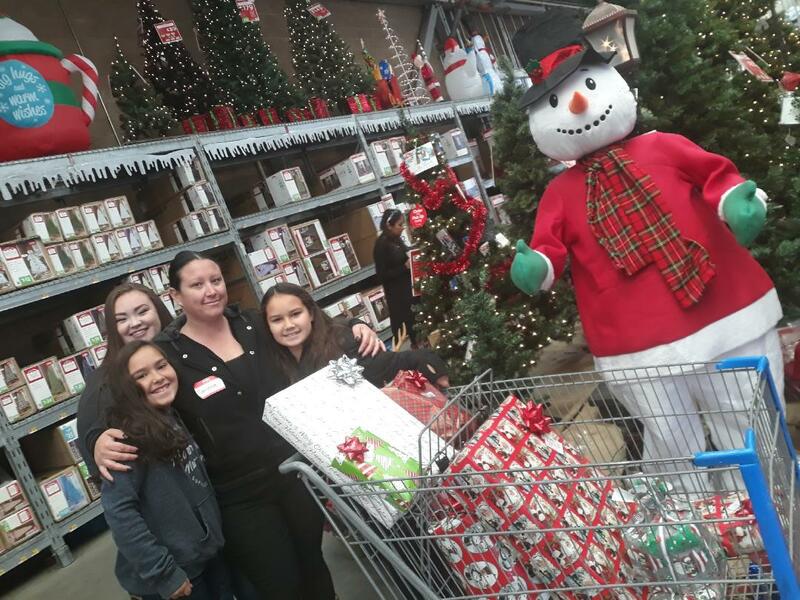 The Rotary Club of Palmdale conducted its 18th Annual Children’s Shopping Spree at the WalMart Super Center on 10th Street West in Palmdale on December 5, 2015. 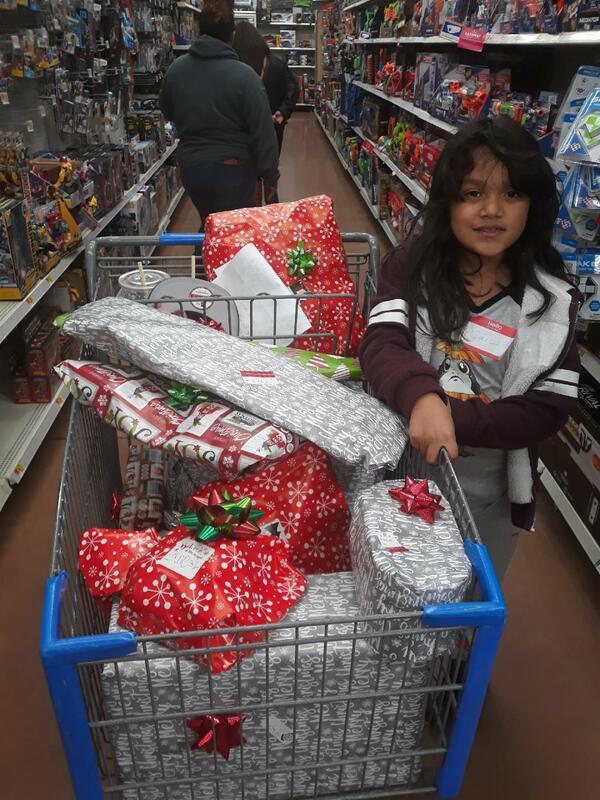 Eighteen children from needy families were selected by club members to participate in the shopping spree. 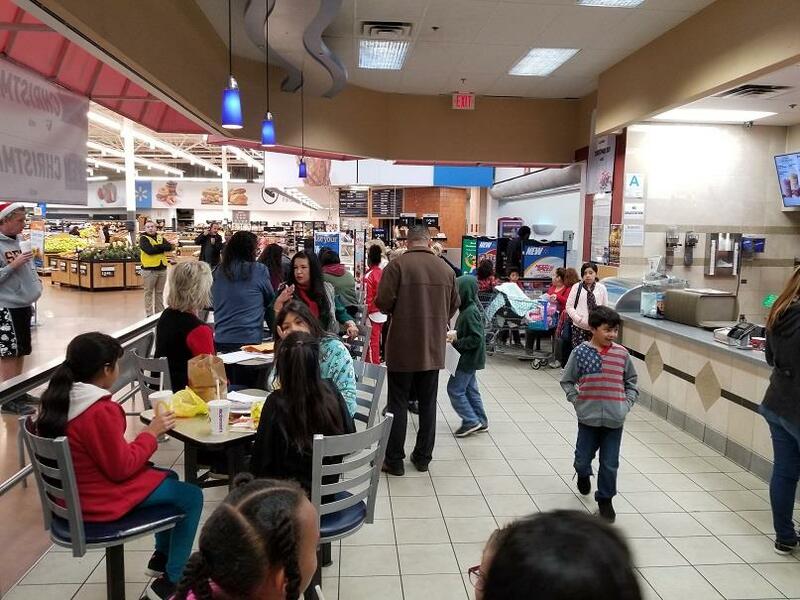 Each child was treated to an early morning breakfast at McDonalds and then escorted by a club member or volunteer throughout the store to shop for family members. 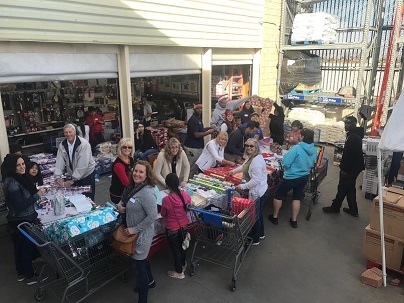 At the completion of shopping the packages were all wrapped with festive holiday wrapping paper and bows for exchange at Christmas. 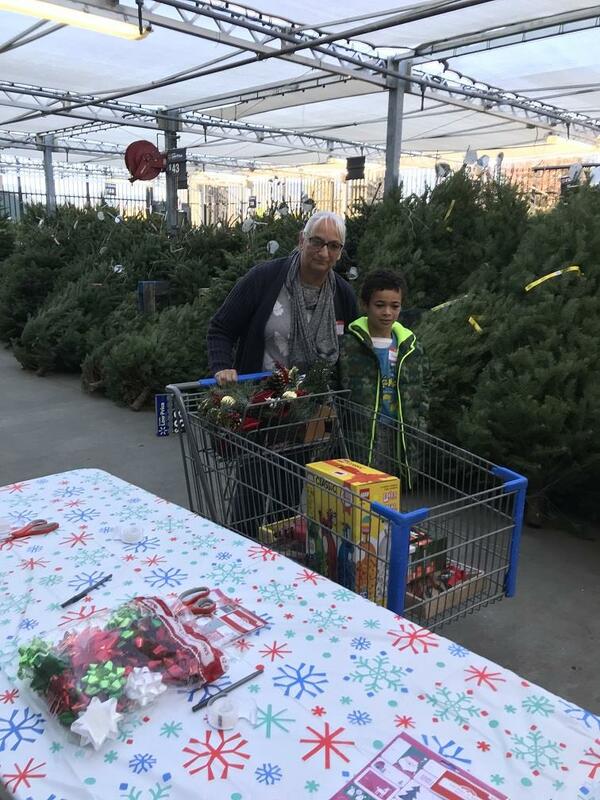 In addition, each child was given and gift card which they could use at the time or wait until after Christmas to select a gift of their choice. 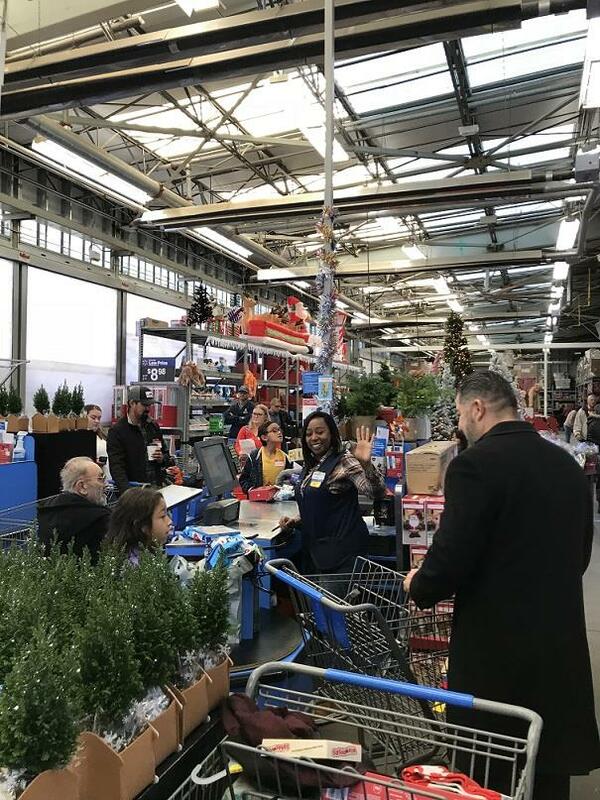 The club established two objectives for the shoppers: To learn to budget the funds provided to them and to better understand the meaning of the holiday season in which it is more rewarding to give than to receive. Those objectives were successfully met. 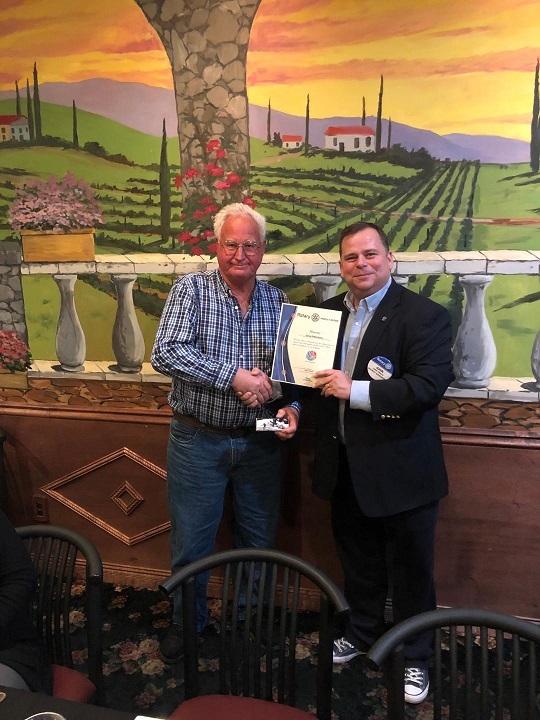 On February 25, 2015 the Rotary Club of Palmdale recognized Norm Hickling (District Representative for 5th District Supervisor Michael Antonovich) for his long time support to our Rotary Club. 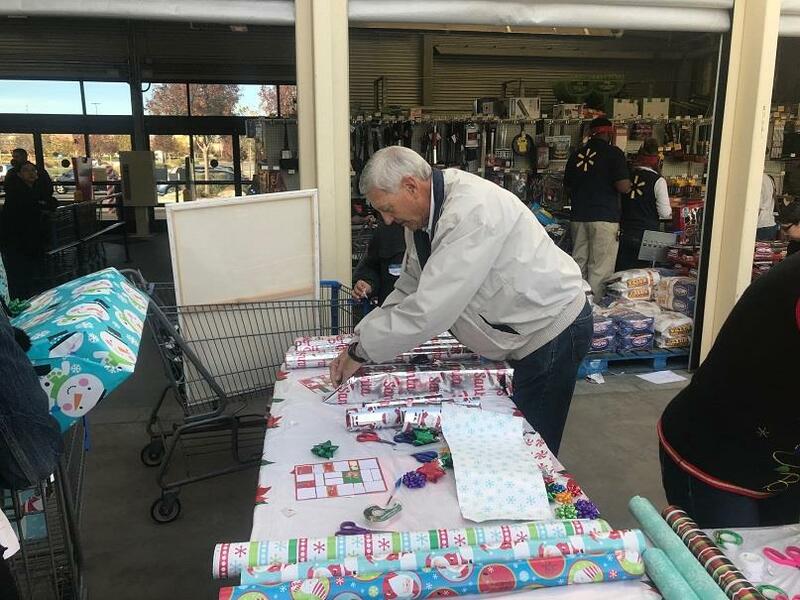 Mr. Hickling has been a strong supporter of the Club for many years and specifically to its annual Children’s Christmas Shopping Spree held each year in early December. Club President Tina Borzage honored Mr. Hickling with a plaque of appreciation. 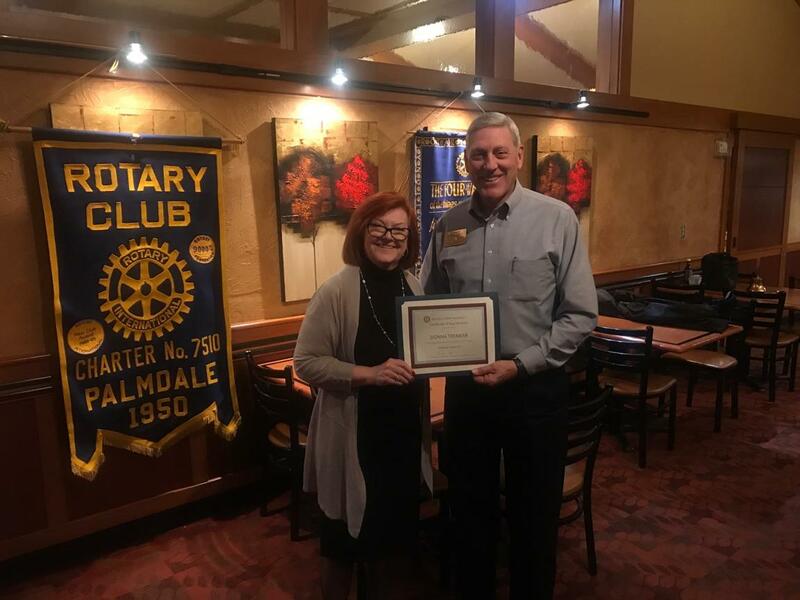 We are extremely fortunate and grateful to be able to include Norm as one of our Friends of Rotary. 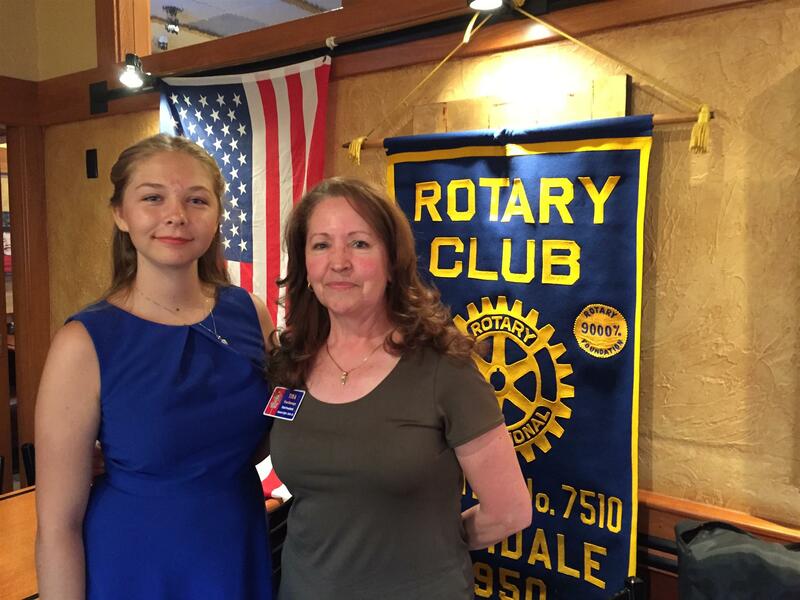 We were so fortunate to meet with one of the students that we sponsored to attend this years RYLA -Rotary Youth Leadership Awards camp. Her name is Jamie Calhousa a student at Palmdale High School. 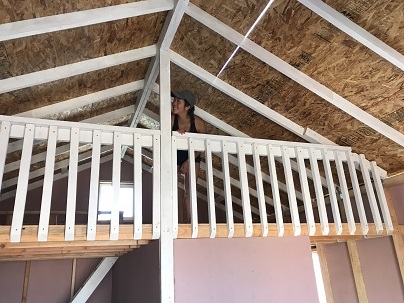 She shared with us her experiences at the weekend event that took place at Thousand Pines Camp in Crestline, CA.on April 17th -19th. The excitement she gained from her experience at RYLA was infectious. 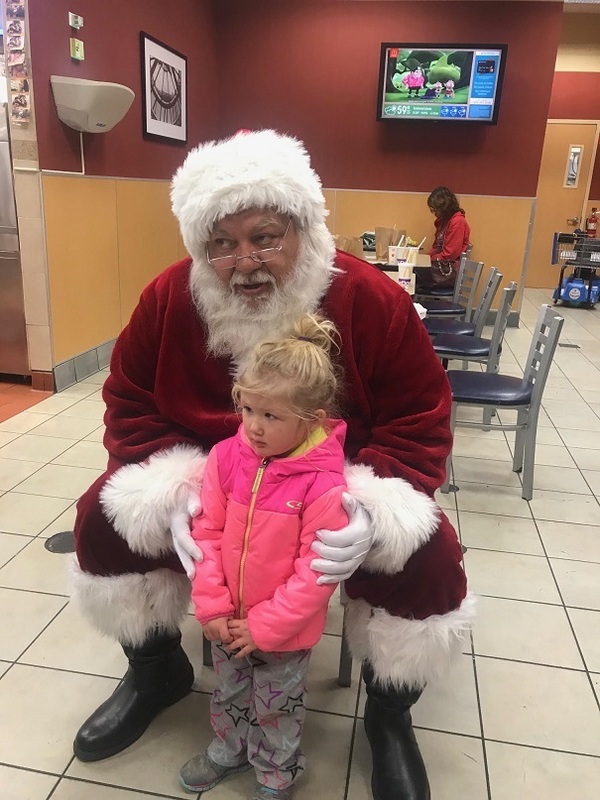 All of our members were impressed with her maturity and goodness and we can tell that she is growing up to be a very special person. We look forward to hearing from Jamie again and hope that her desire for "service above self" continues to grow. I used to be indecisive; Now I'm not so sure!